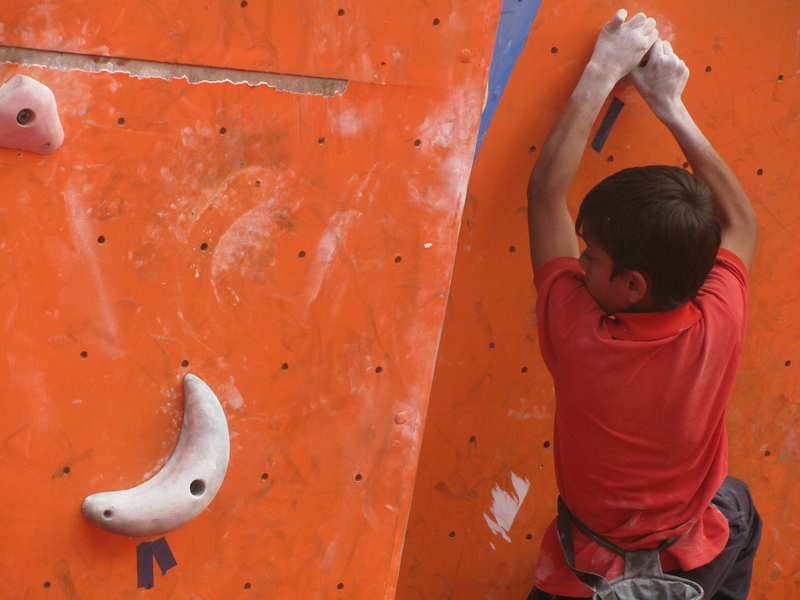 Please note: The 2014 Girivihar Climbing Competition concluded on January 26. Featured herein, are daily reports filed when the event was on. 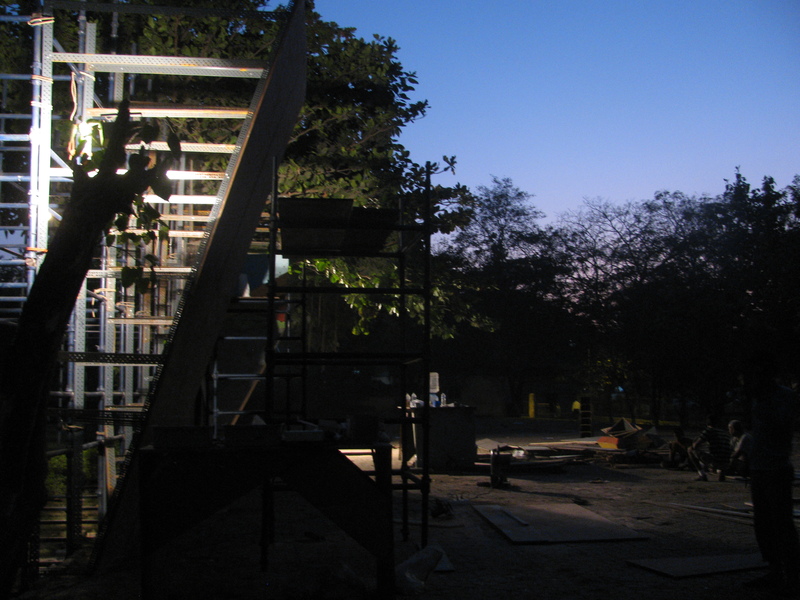 For an overview of the run up to the 2014 competition and a simple primer on how a competition works, please visit the earlier post: 2014 Girivihar Climbing Competition / Countdown. Day 4 / January 26: Republic Day. Last day of the 2014 competition when the wall would be open for the public to climb. I reached Belapur, late afternoon. The public had come, climbed and gone. 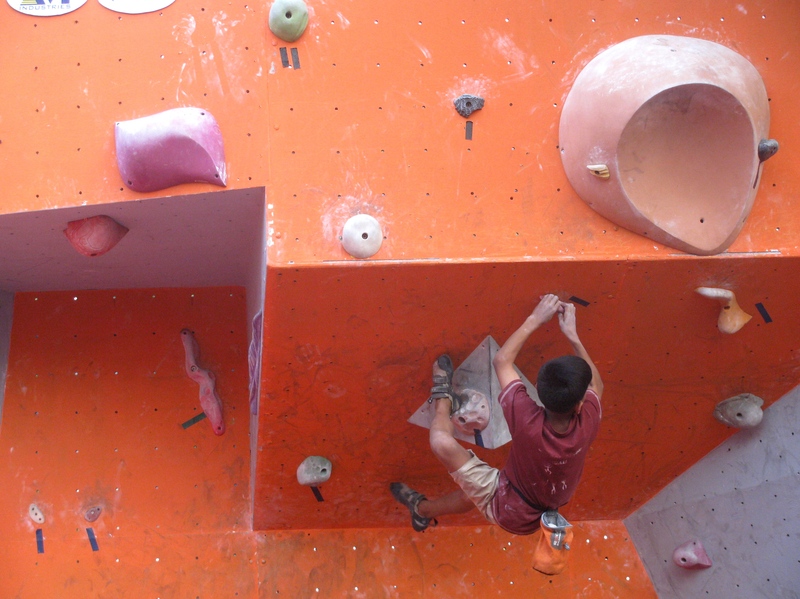 The beautiful orange wall was being taken down, starting with the climbing holds. Some of those who had participated in the Master’s round helped, among them – Gaurav Kumar, Madhu C.R, Manikandan and Sandeep Maity. As the crash pads were taken off the ground and stacked in a pile, three young boys ran in to climb the stack and sit on its heaving surface. Nine year old-Rajbeer Singh sat atop it still wearing the gold medal he had just received at the nearby stadium for winning a 200 metre-race. Bhangra music from the stadium wafted in. A portion of the climbing competition’s venue had been taken over by a group playing cricket. In India, that game is like the sea at a beach. Other sports and games live in the land revealed between a wave receding and another rolling in. The climbing competition’s time was up. Sandeep Bhagyawant brought a box of ice cream. It was relief for those working to dismantle the wall in the hot sun. Freelance journalist also got one. In Mumbai and Navi Mumbai, winter has become a flash in the pan. Welcome to warm January. There was something touching about the scene before me – devotees of a fringe sport, club members and volunteers who had sweated it out to hold a climbing competition, now dismantling just what they laboured to assemble. The orange wall developed gaps like knocked out teeth, as panels were taken off. 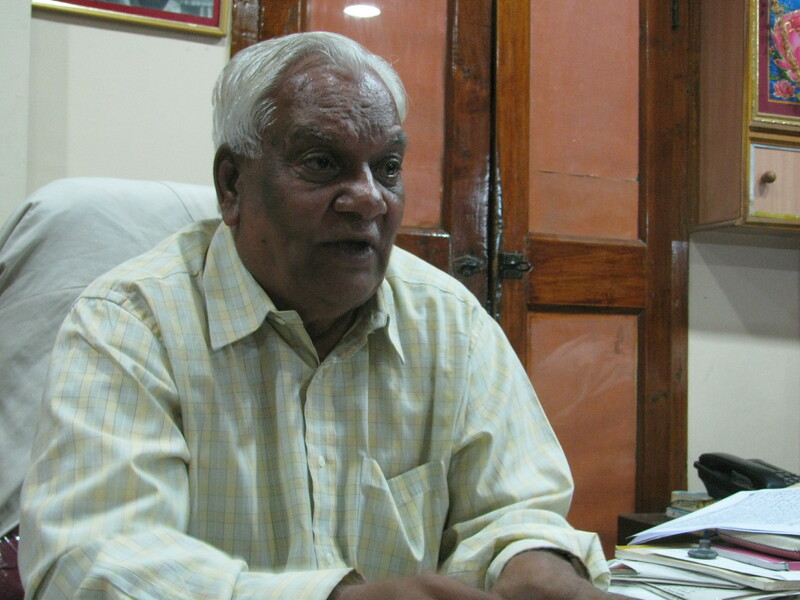 Franco Linhares, former president of Girivihar, was there helping with the day’s work. I asked him what he thought of the just ended eleventh edition of the event. “ This is the best wall we have built so far. We also had a greater variety of holds and features to work with,’’ he said. The quality of Indian climbers in the men’s category has improved. Although there is still much distance between the best of Indian sport climbers and those from elsewhere in Asia, they have become stronger. “ But there is a lot of catching up to do in the women’s category,’’ Franco said. 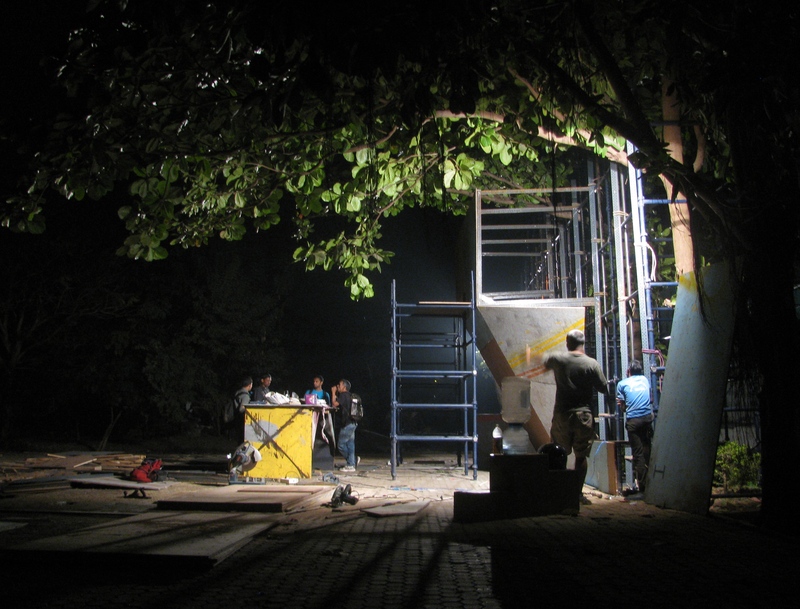 As I write this, the arc lights may have been switched on at site in Belapur to help the team finish their wind-up work. The wall on the eve of the 2014 competition. Except this time, there wouldn’t be an orange wall shining bright centre stage. Thank you for looking up all the posts regarding the just ended competition, from countdown to daily reports. I dedicate the posts to a beautiful orange wall. Day 3 / January 25: After the Master’s round of the annual Girivihar climbing competition concluded on Friday (January 24), it was the turn of the amateurs. 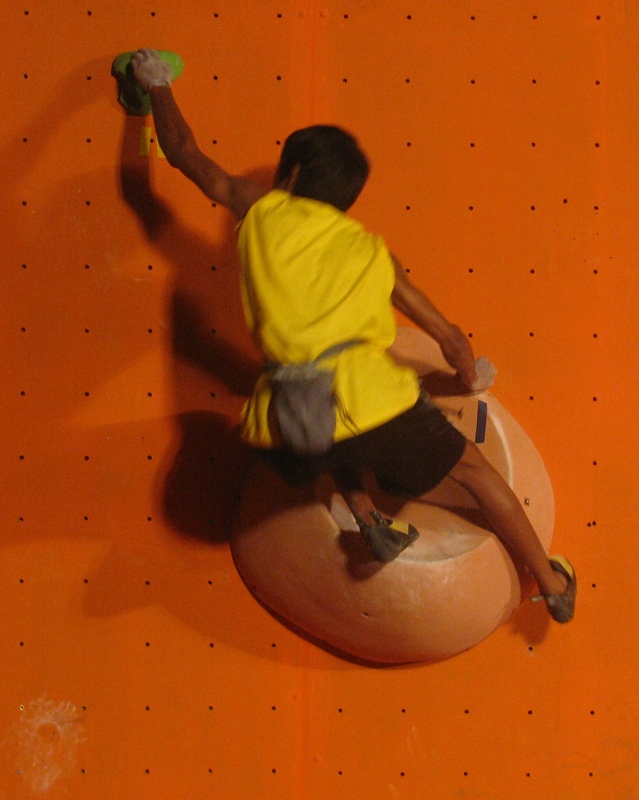 Shimul Bijoor (this category had one winner as only one person finished a boulder problem). The mood at the venue was more relaxed and playful today given the large number of school children around. Many of the seniors who had competed in the Masters’ category stayed on to cheer the amateurs and help in route setting. 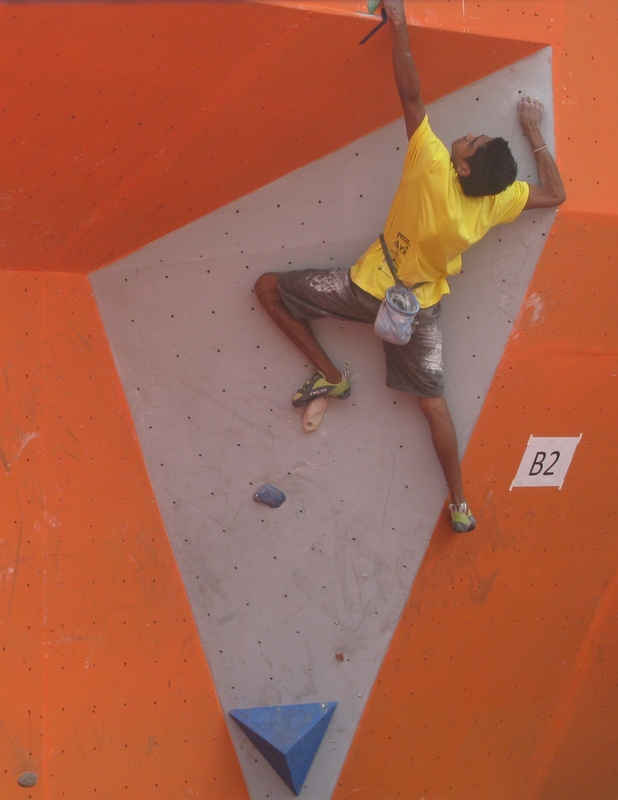 The competition’s Chief Route Setter Vaibhav Mehta spared time to talk to this blog. 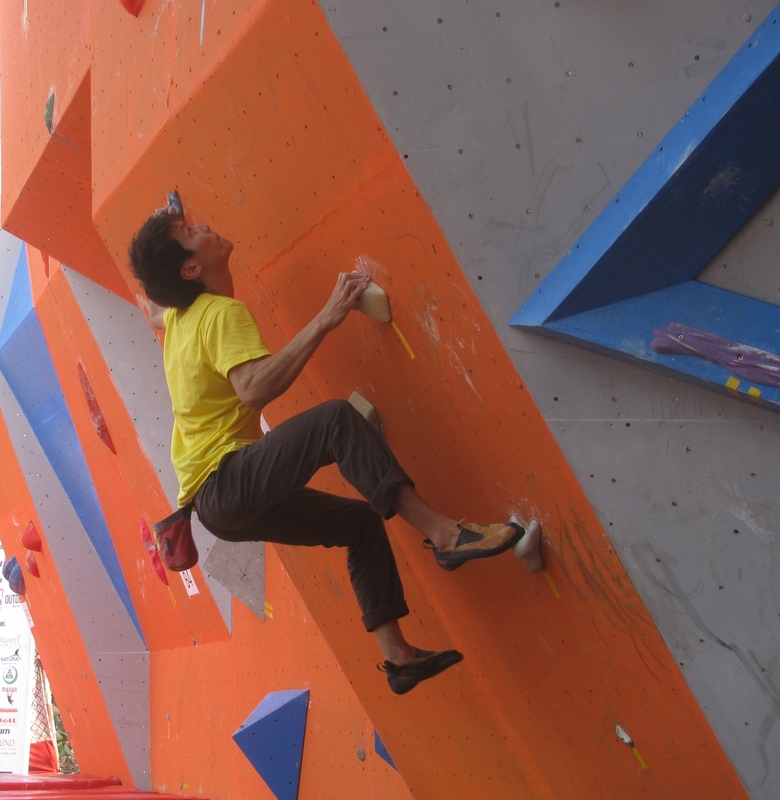 According to him, in the Masters’ category, the 2014 edition of the event saw boulder problems ranging in difficulty from 6b+ to 7c+ for men and from 5c to 6c for women. Over the years, the grades have been rising. “ The competition is getting better every year. There has been much improvement in the calibre of Indian participation,’’ Vaibhav said. As mentioned in the report of January 24, when the men’s competition in the Masters’ round, reached semi final stage, some of the promising Indian climbers got eliminated or barely scraped through to the final. Anything can happen in competitions. Still, in the run up to the event, there had been much expectation from a bunch of youngsters who recently broke through grades in sport climbing, considered very tough for Indians. Quite a few of these climbers were present at the 2014 competition. Singapore’s Adriel Choo handled their challenge well in the semi final and calmly proceeded to win the final, successfully defending his title. I asked Vaibhav, one of the finest sport climbers around when he was based in Mumbai and active in the climbing scene here, what he thought of Adriel. “ He handled the pressure very well,’’ Vaibhav said, adding that the Singapore climber seemed rich in exposure to competitions. He was experienced and comfortable with the format. Some things about Adriel genuinely impressed. For instance, irrespective of how his fortunes were with a particular boulder problem, he didn’t carry its legacy over to the next one. He approached every problem with a fresh mind. Adriel also came across as a technically competent climber with strong route-reading ability. 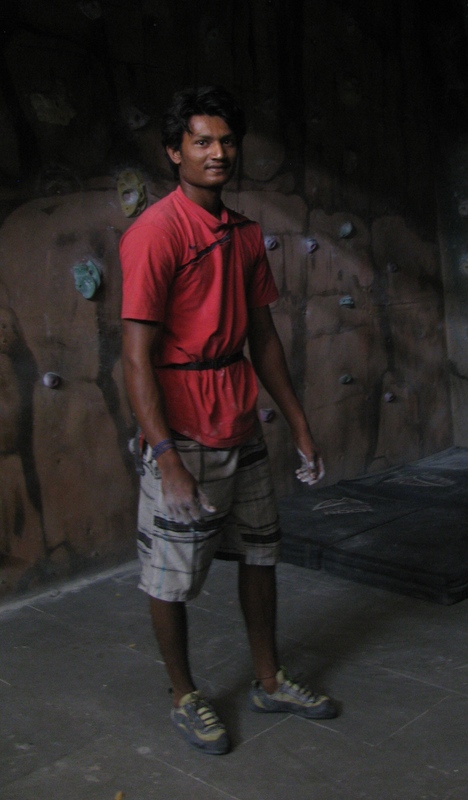 But what endeared him to Belapur’s climbing community and the audience at the competition, was his humility. Once he finished climbing all the boulder problems in the final, Adriel bowed to the audience which had consistently cheered him. 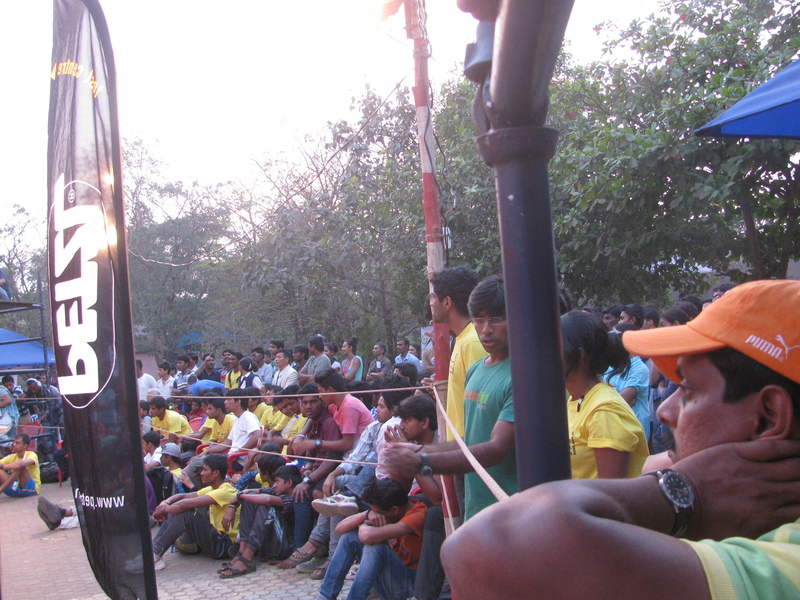 “ An audience like the one we get at Belapur, comes to see good climbing. Adriel gave them that, plus he bowed to the audience to express gratitude for their support,’’ Vaibhav said. This combination, he felt, was something Indian climbers should notice, not to mention – the said quality and others cited previously, seemed to be there in all the participants from Singapore, pointing to a general standard in the team. While Adriel repeated his triumph in the men’s category, his team mates Janet Goh and Lynette Koh took first and second place respectively in the women’s category of the Masters’ round. Day 2 / January 24: The team from Singapore swept top honours on the second day of the eleventh edition of the annual Girivihar climbing competition. Last year’s winner Adriel Choo successfully defended his title in the men’s category while team mates, Janet Goh and Lynette Koh, placed first and second in the women’s category. 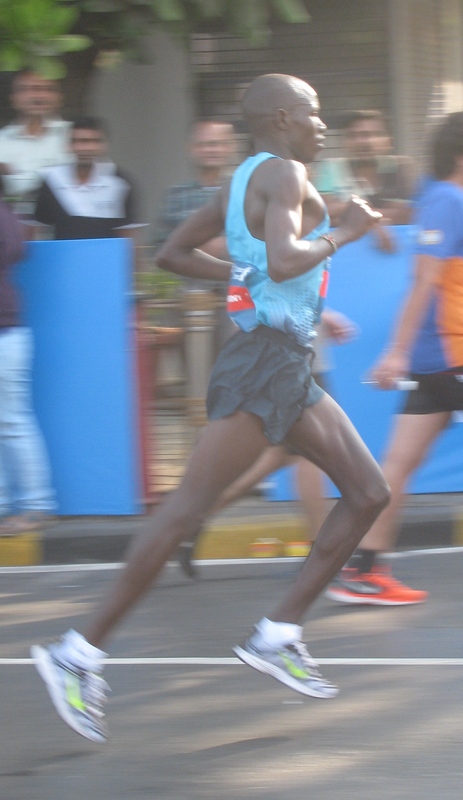 Tuhin Satarkar (Pune) and Michael Schreiber (Germany) finished second and third in the men’s category, while Neha Prakash (Bangalore) took third position in women’s. Some of the Indian climbers who looked strong and promising in the first round of the men’s category on Thursday (January 23), faded in the tough semi final. Also exiting in the semi final held today afternoon, was the team from Iran and two climbers from the Singapore contingent. The top five from the first round – Sandeep Maity, Ajij Shaikh, Tuhin Satarkar, Adriel Choo and Vicky Bhalerao, plus Michael Schreiber, made it all the way to the final. But from the semi final onward, Adriel Choo was a changed climber, increasingly showing the ability for calm, clinical execution of well planned climb, at every boulder problem. 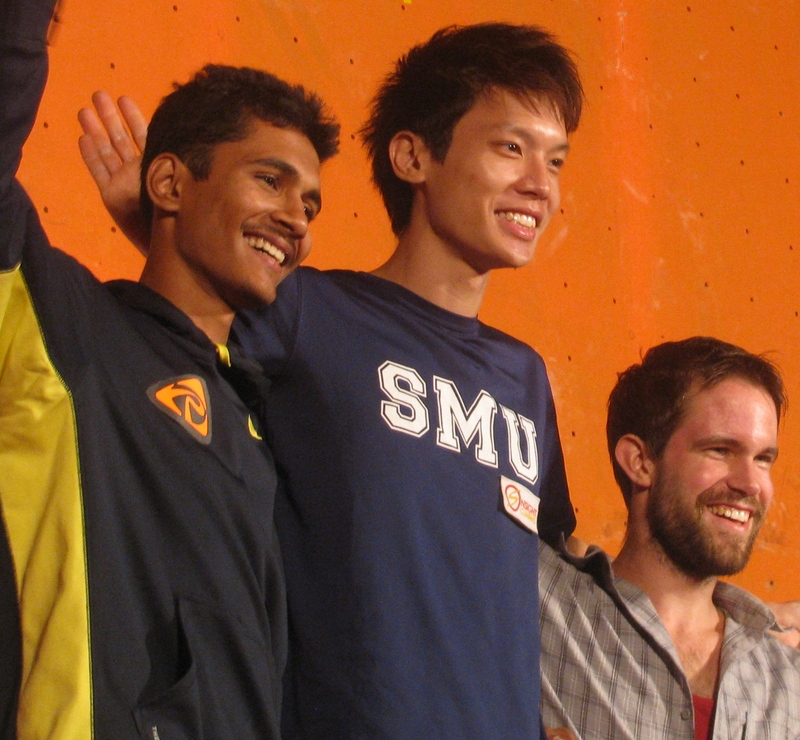 Tuhin Satarkar – he recently became the first Indian to climb an 8b+ sport route – and Michael Schreiber, kept the competition close particularly for second and third positions. Similar systematic build up to peak performance graced the two winners from Singapore in the women’s category. In the final, Janet Goh was superb on the wall, while Lynette Koh followed closely, stronger perhaps in terms of daring but eventually limited by her smaller size. The list of finalists in the women’s category also included Siddhi Manerikar (Mumbai), Vicki Mayes (UK) and Shantirani Devi (Bangalore). At programme’s close, prizes were distributed. With this, the Masters’ segment of the competition has concluded. Tomorrow (January 25) there will be competitions in the amateur category. On January 26, the wall will be open for the public to try their hand at climbing. There will be a workshop on climbing for citizens. Day 1 / January 23: There were winners on the very first day of the eleventh edition of Girivihar’s annual climbing competition. Adarsh Singh from Delhi emerged first in the boys’ category. 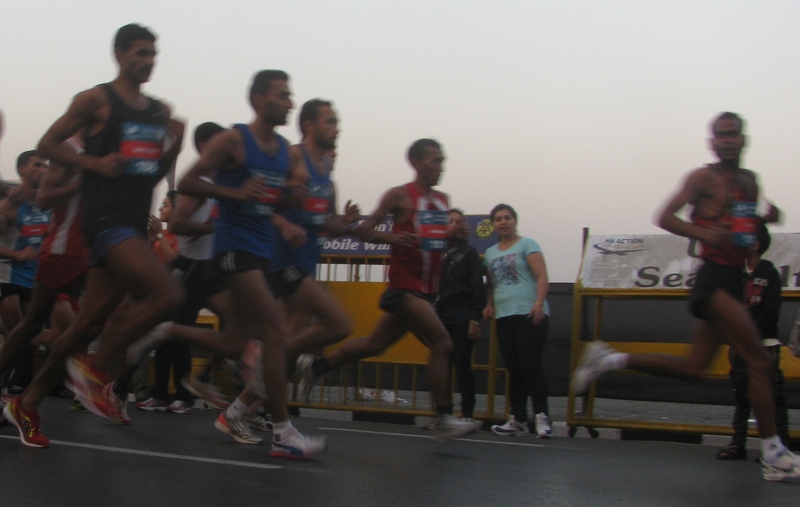 Akash Gaikwad and Sachin Ahire, both from Mumbai, placed second and third respectively. This category had only one round owing to limited turn out in that age group. Still the quality of climbing on display was impressive. Earlier today morning, the open competition, organized by Girivihar, Mumbai’s oldest mountaineering club, had kicked off with little ceremony and much action. There wasn’t any formal inauguration. After breakfast, registration and final touches to the venue – including getting all the crash pads properly arranged on the ground – the Master’s category of the event got underway. There were thirty six participants for the first round in that category. Sandeep Maity (Delhi), Ajij Shaikh (Pune), Tuhin Satarkar (Pune), Adriel Choo (Singapore), Vicky Bhalerao (Pune), Somnath Shinde (Pune), Mohammad Ashraf (Singapore), Ranjit Shinde (Pune), Ryan Yeo Hong (Singapore), Hossein Mahani (Iran), Rohit Vartak (Pune), Guarav Kumar (Delhi), Michael Schreiber (Germany), Nevin Rajen (Singapore), Sidharth Adhav (Pune), Muhindra Lamabam (Manipur), Swapnil Bandal (Mumbai), Hosseini Mehdi (Iran), Prathamesh Sangale (Mumbai) and Indranil Khurungale (Pune). Semi final and final across both categories – men and women – will happen tomorrow (January 24). Competition in the women’s category begins with semi final. Such decision – whether contest should begin with an opening round, semi final or straight with final (as happened in case of boys) – is based on the number of participants registering for each category. This year, the Master’s category – basically those who have climbed previously at national level or have proven climbing experience with grades (measure of difficulty on given route) to match – received good participation. 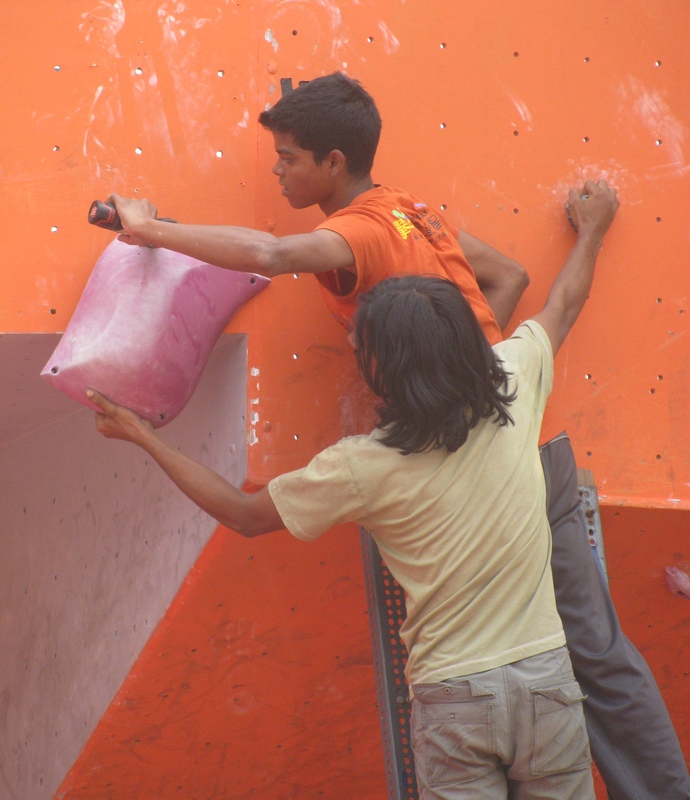 Although begun on natural rock and spanning both bouldering and lead climbing, the Girivihar competition now restricts itself to bouldering with competitors attempting to solve boulder problems on an artificial climbing wall. At the end of boys final, which was the last item today, the wall was opened up for half an hour, for everyone to climb. At one go, almost the entire audience shifted to the wall and were seen having a wonderful time climbing. That also tells you something about the world of climbing in India. It is a relatively small group of people, passionate about climbing and typically at events, both participant and audience. I had never seen the Standard Chartered Mumbai Marathon (SCMM). So early today morning (January 19, 2014) I joined the many who lined the streets of the city to watch the runners go by. Predictably my small camera was challenged trying to photograph the elite athletes. It found slower world around, easier to capture than runner whizzing by. The top athletes maintained quite a pace. Amid the corporate overdose, the branding and sense of heavy duty event – the pace of the elite lot was my take away of the day. They and all else who ran, even those who attempted to; they restored to me what I had come to see – running. In 1997, two climbers from Pimpri-Chinchwad near Pune visited Bikaner in Rajasthan, at that time the only town in western India to have an artificial climbing wall. 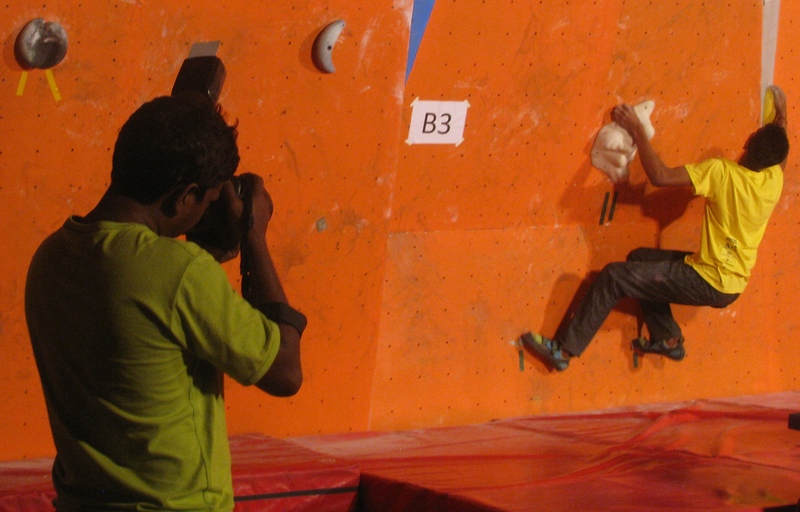 Bikaner represented the new face of climbing. Its wall was ambassador for sport climbing, especially competitive climbing. Artificial walls were common overseas. Yet in the world’s second most populous country with a rising tide of urbanization and growing chunk of youth in its demography, the late 1990s played host to only a few isolated walls. Mumbai, India’s biggest city had none; as did Pune. On the other hand, away from the Himalaya, Maharashtra was among states actively engaged in rock climbing and mountaineering. It had a tradition of climbing rock faces and pinnacles in the Sahyadri (Western Ghats). In 1988, it had produced the first civilian expedition to an 8000m-peak with climbers reaching above 8000m on Kanchenjunga before retreating. A year after Shrikrishna Kaduskar and Surendra Shelke visited Bikaner – in 1998 – the first Maharashtrian would reach the top of Everest. Sport climbing especially competition climbing on artificial walls – was a missing piece in the state’s climbing mosaic. 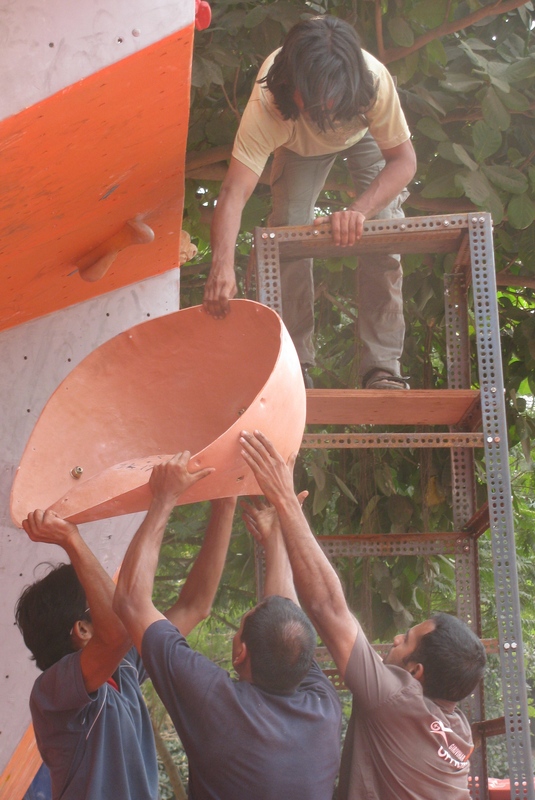 Shrikrishna and Surendra resolved to get their home town a climbing wall. However they had more than a wall in mind. They had fashioned an approach – what they felt was best suited to both popularize a culture of climbing walls and keep them easily accessed by the public. Pimpri-Chinchwad, just outside Pune city, was the industrial hub of the region, home to many big engineering and manufacturing companies. It also had one of the wealthiest municipal corporations in India. On return to Pune, the duo submitted a proposal to the Pimpri-Chinchwad Municipal Corporation (PCMC) to build a wall. 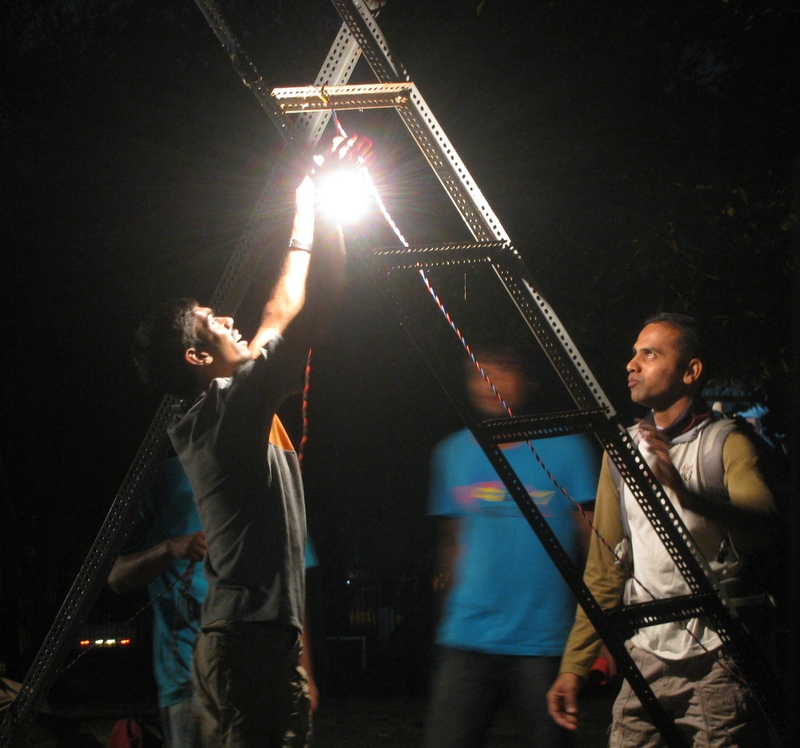 Then and now, climbing was and is a small sport in India, challenged for financial support. Shrikrishna and Surendra had set themselves a particularly tough assignment for not only were they seeking infrastructure in climbing, they were also seeking its approval and execution by local government. They ran from table to table and meeting to meeting, pushing things through with sheer passion till at last – in 2001, the wall came up near the Annasaheb Magar Stadium in Pimpri-Chinchwad. En route, they also addressed a related problem. Climbers are notoriously self-centred. Selfish would be wrong word to use, for that they aren’t. The thing is – climbing by its very nature is all about limiting the world to immediate environment. Climbers are doers. If you don’t climb, there isn’t any climbing – it is that simple. This often limits the merit they see in imagining / co-operating beyond immediate goal to be achieved. Consequently, the culture of outdoor clubs, mountaineering clubs and climbing clubs in India are full of stories on how they couldn’t come together on one platform to get important things done. Egos intervene. Personalities clash. Shrikrishna and Surendra belonged to a particular club – the Moraya Giri Brahman Sanstha. They knew the wall would succeed only if they got everyone aboard. So, the duo worked towards forming the Pimpri-Chinchwad Mountaineering Association (PCMA), comprising participation from all clubs. PCMA became the active face of the wall, running day to day operations. Looking back, you could say this was how the story of competition based-sport climbing in Pune began. And certainly therein, the story of a group of youngsters, first appearing on the scene as school students, later fetching podium finishes at national level competitions. To those in Pimpri-Chinchwad, sport climbing was both new sport and a spectacle in the neighbourhood, for there is something intrinsically fascinating about climber moving up a wall. It contrasts one’s own safe stance on the ground and climber’s progression up vertical surface, so unnatural to the human being. The PCMC climbing wall, like any other, had fixtures on it – there were artificial holds; metal anchors, metal nuts and bolts. Additionally, when climbers arrived to practise, there would be their belongings ranging from water bottles to wallets, karabiners and other hardware kept by the side. The wall had no lockers. Not even for the group gear used on the wall. Everyday Shrikrishna brought group gear to the wall and took it back. The wall’s locality was not far from urban slums and its typically desperate population, growing up in denial, seeking the slightest route to scarce money. Theft became common. Personal belongings were lost. Climbing holds disappeared from the wall, as did nuts and bolts and sometimes, anchors. The thieves had no idea what the metal devices were meant for or even the actual composition and value of its expensive alloys. It was sold as scrap for a quick buck. On the other hand, it is the stated policy of any local government building infrastructure that access to the facility should be equal for all and it should benefit the local community. Slowly, the youngsters hanging around, unable to contain their curiosity, began climbing. “ For us, it was also definitely a way to get around the problem of theft. As their ownership of the activity increased, the locals urged those stealing to stop doing so. They knew who were doing it,’’ Shrikrishna said. I remember the PCMC wall as a simple, tall structure with a climbing wall on only one side of its framework (later a second wall was added). Next to it was the local swimming pool owned by the municipality. Between the two facilities was a long, low granite wall, basically the edge of the land on which the pool stood. This stone wall was also used by the climbers. They traversed it – hanging on with finger tips and perched on their toes – building up endurance. Typical of India, this creative mix of available options confidently hosted new ideas. It was all fuelled by interest, raw interest. During my days in climbing several years ago, I attended a clinic on sport climbing here. That was the first time, I saw the PCMC wall. 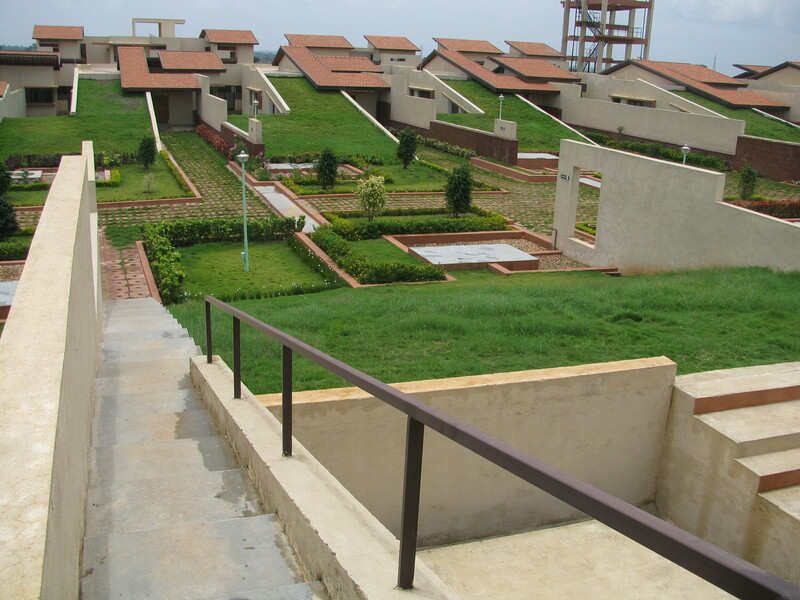 In 2002, wall in place, Pimpri-Chinchwad hosted its first west zone competition. Those going in for the final rounds at the nationals were selected through zonal competitions. That was the norm. Around 370 participants arrived at the PCMC wall. 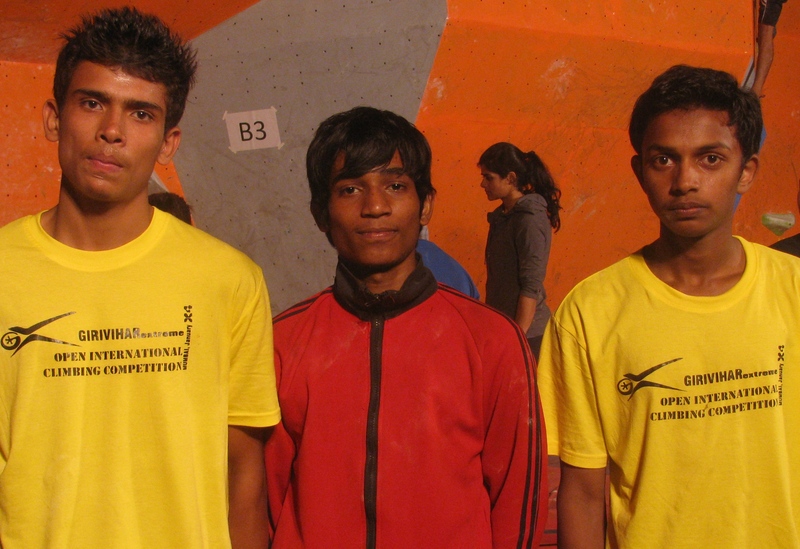 In the ensuing competition, not one climber from Maharashtra qualified for the nationals. It was a humbling experience, one that showed where the state stood in the sport. But a large competition in town had its own silent impact. “I saw that 2002 competition and decided to start climbing,’’ Suresh Kohare, who hails from an underprivileged backdrop in the neighbourhood of the wall, said. He joined the ragtag bunch of climbers from the local community, now regularly climbing and slowly maturing. The training at the wall was totally free of cost. “ We charged them nothing,’’ Shrikrishna said. As the abilities of these youngsters became visible, Shrikrishna and Surendra visited the localities they came from, convincing people to send their children to climb. Luckily, there was one participation model available to tap and which the PCMC to its credit, made available. The municipal corporation ran schools in the region and most of the underprivileged students studied at PCMC schools. These schools had policies in place to promote participation in sports. 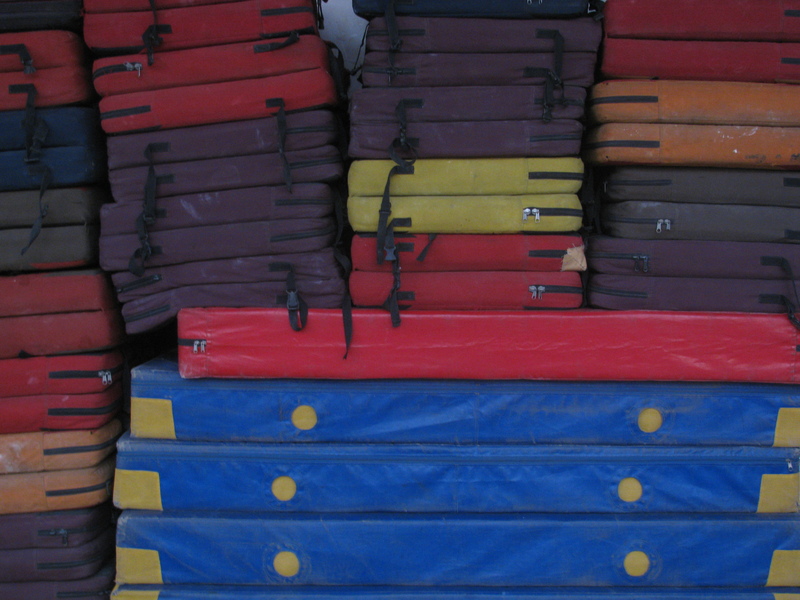 The PCMC formally recognized climbing as a sport to support at its schools. To this date, it is the only municipal corporation in India to have done so, Shrikrishna said. That recognition for climbing also meant students good at the sport merited financial support – for example, they got a nominal travel and daily allowance when they travelled to other places to participate in climbing competitions. 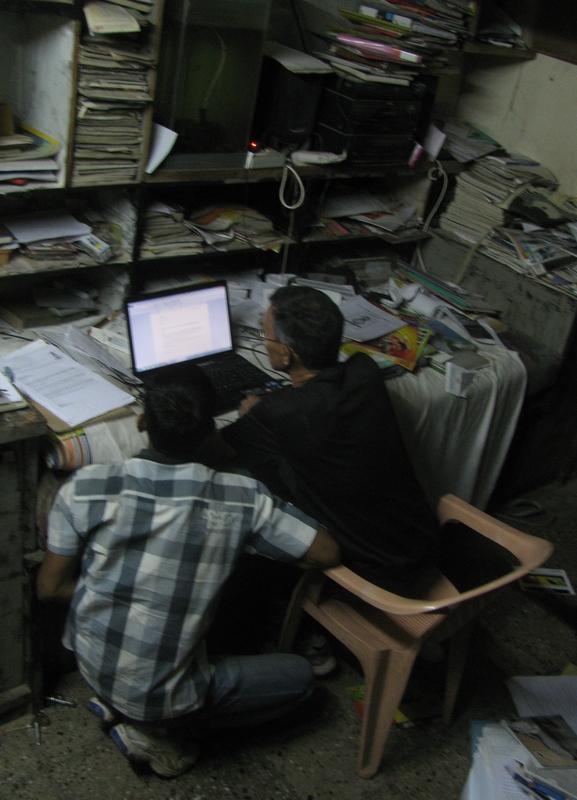 As they visited the students’ houses, tackling the parents was hard work for Shrikrishna and Surendra. There was the obvious risk all parents saw in climbing and in the subsequent quest to affix responsibility they saw Shrikrishna and Surendra as where the buck stopped. The PCMC had students sign an indemnity bond but in reality parents saw the duo as being responsible. Needless to say, this was dicey. 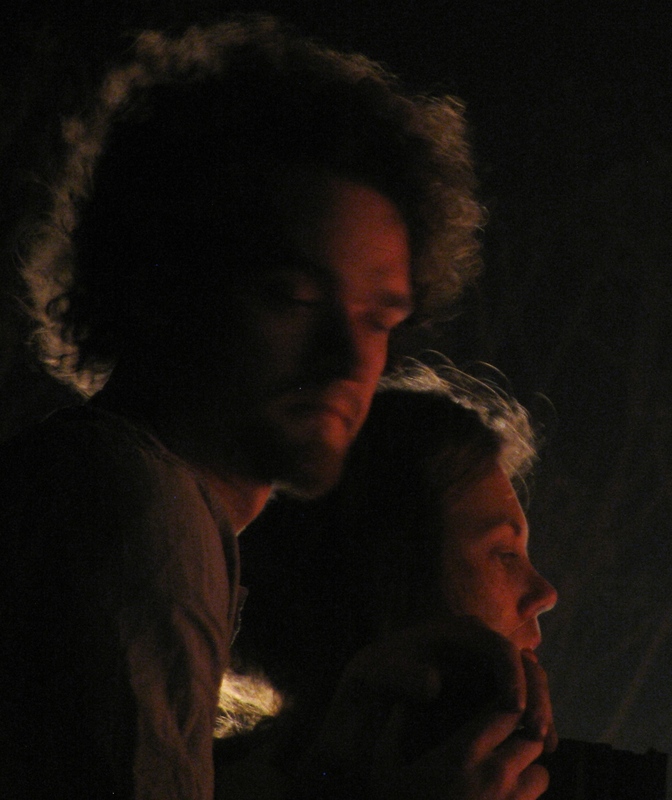 But the duo persisted as there was underlying passion to do something in and for climbing. Then there was the whole question of – what do you get from climbing? Remember, these are questions posed by people already living utterly difficult lives, in localities beset with social problems ranging from drinking to gambling. 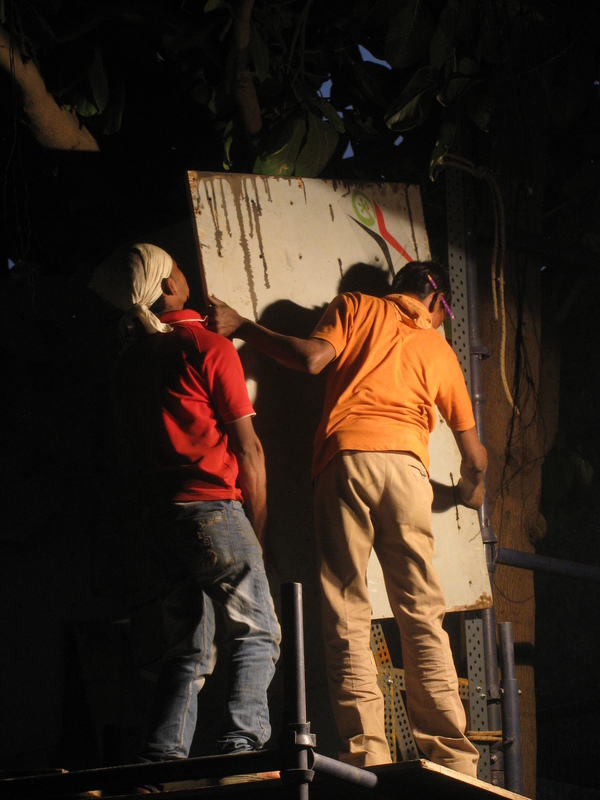 According to Shrikrishna, some of the best climbers that the PCMC wall produced never advanced further because their family compulsions saw them trade climbing for regular means of livelihood. Nevertheless, from 2002 onward, the duo ensured that a team of 30-40 local students participated at every annual west zone competition. 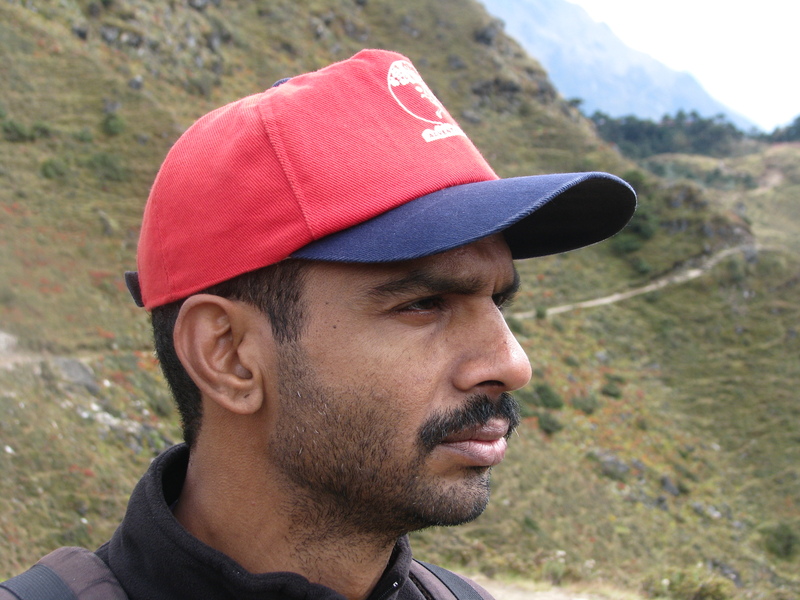 The experiment secured result in 2005, when for the first time, two or three climbers from the PCMC wall, graduated to participate in the nationals with Somnath Shinde emerging a medal winner in lead climbing in the junior category. Following this, Shrikrishna and Surendra began to think – why not use the PCMC wall-model to set up more walls in Pune, even elsewhere in Maharashtra? In 2005, they – under the aegis of the PCMA – submitted a proposal to the Pune Municipal Corporation (PMC). 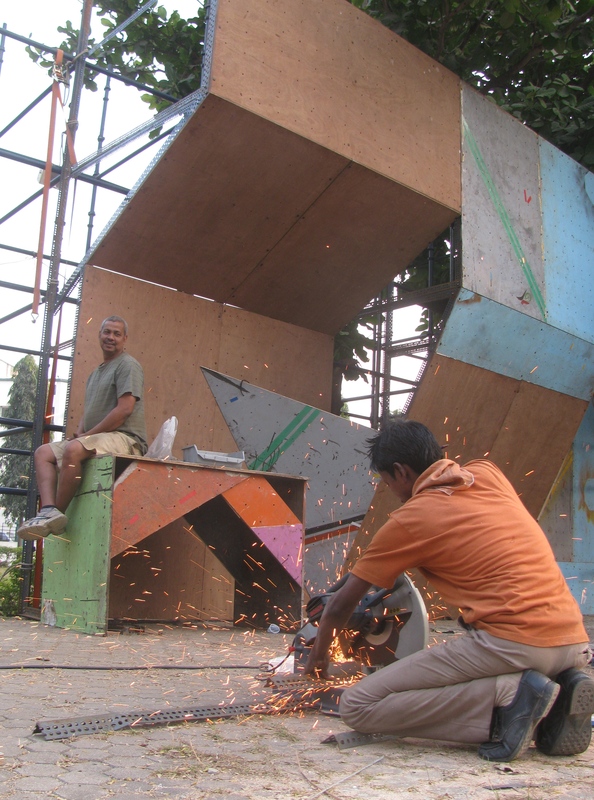 In 2008, after much scouting, the duo was shown some vacant space in the premises of the Shri Shivaji Vyayam Mandir in Pune’s Shivajinagar. It wasn’t perfect for the space assigned for the wall was trifle cramped. But Shivajinagar was centrally located. Plus they got complete support from the local representative to the PMC, Balasaheb Bodake. In 2010, the Shivajinagar wall opened. It has both lead climbing and speed climbing walls. Soon after inauguration it shut shop for 3-4 months as the PMC took that long to approve the rates the PCMA could charge those reaching the facility to climb. By then, there was also another sad story to cope with. The old PCMC wall, from where this whole story commenced, had shut down reportedly due to the corporation insisting that the PCMA assume onus for security as well and not just daily operations. This caused a drift. 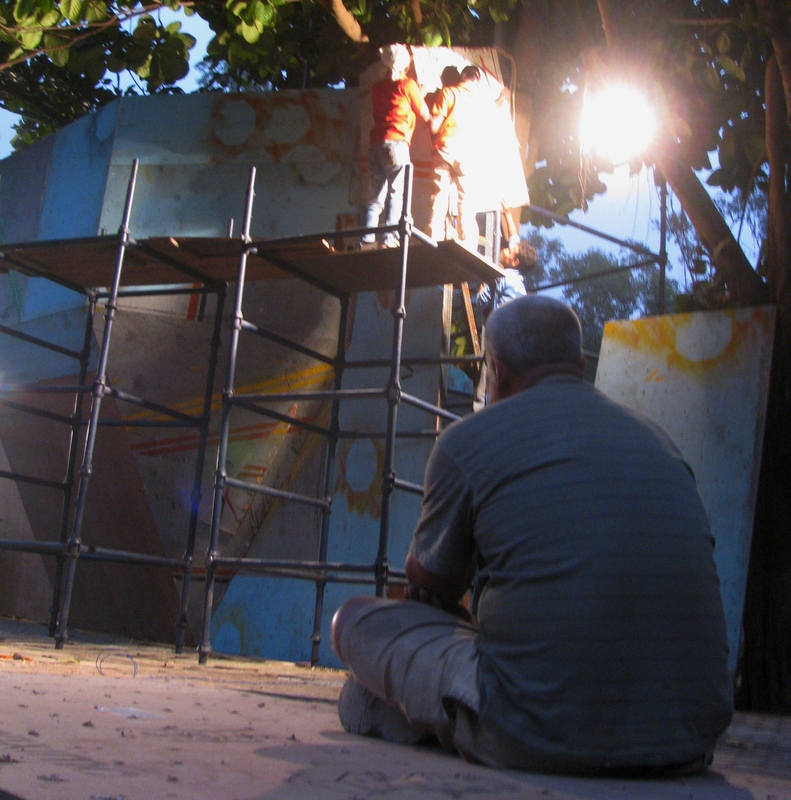 Shut down and neglected, things have again gone missing from the old wall, Suresh said. Climbers from the PCMC wall now travel to Shivajinagar in Pune, to climb. On the bright side – there is one full fledged sport climbing wall available for use. Talks are on to restart the PCMC wall, Shrikrishna said. It is supposed to be winter in Pune. Strangely, it is pleasant and there is no need for a sweater. Global warming, I tell myself. It is an odd world, mine. There was right then freezing cold in the US, complaints of cold winter from North India, yet this lack of cold in Pune, 1800ft up from sea level. I am at the Shivajinagar wall to meet Ajij Shaikh, perhaps the best result yet from the original PCMC experiment. To talk, we go inside the wall. The design of this wall included what was amiss at the PCMC wall. Here you have rooms to store equipment under lock and key. The first floor appeared make-shift stay-over for climbers. They rested between climbs on a row of crash pads; tired, sleepy youngsters, seemingly oblivious to everything except life lived hold-to-hold. The second floor was a bouldering gym. Then, you had the ladder well leading straight up to the top of the wall, helpful to install climbing ropes et al. The whole thing reminded me of a tree house. Perfect getaway, if all you wanted to do in life was climb, rest, climb, rest…so on. Ajij, 22 years old, is here every day. 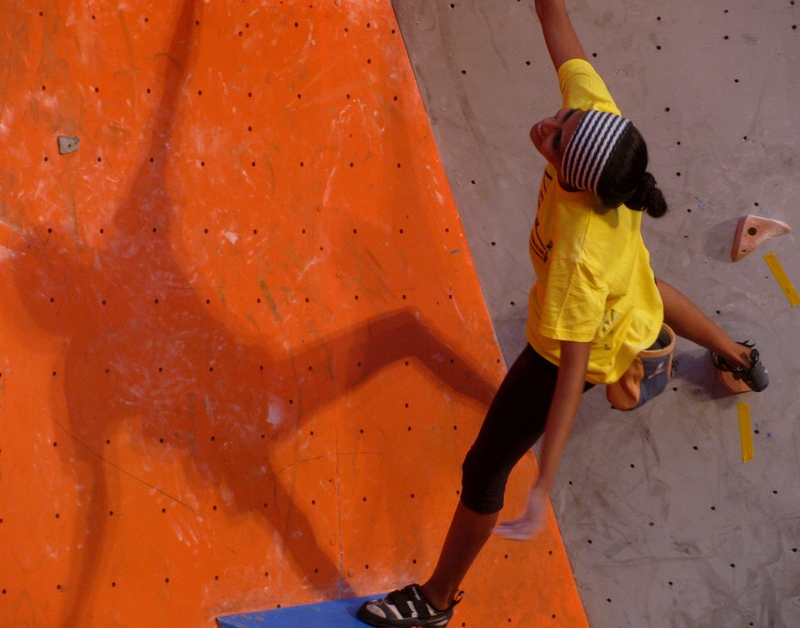 As are other promising climbers like 18 year-old Vicky Bhalerao. Both these names as well as some others from Pune, were familiar to me from their regular participation at the annual climbing competition held by Girivihar in Mumbai. Ajij owes a lot to yoga – that is clear. He began his story so, remembering Vivek Sable, his yoga teacher at school in Sant Tukaram Nagar. He recalled the yoga sessions, his competence at it and eventually his participation in yoga competitions right up to representing Maharashtra at national level contests. “ It made my body flexible,’’ he said. 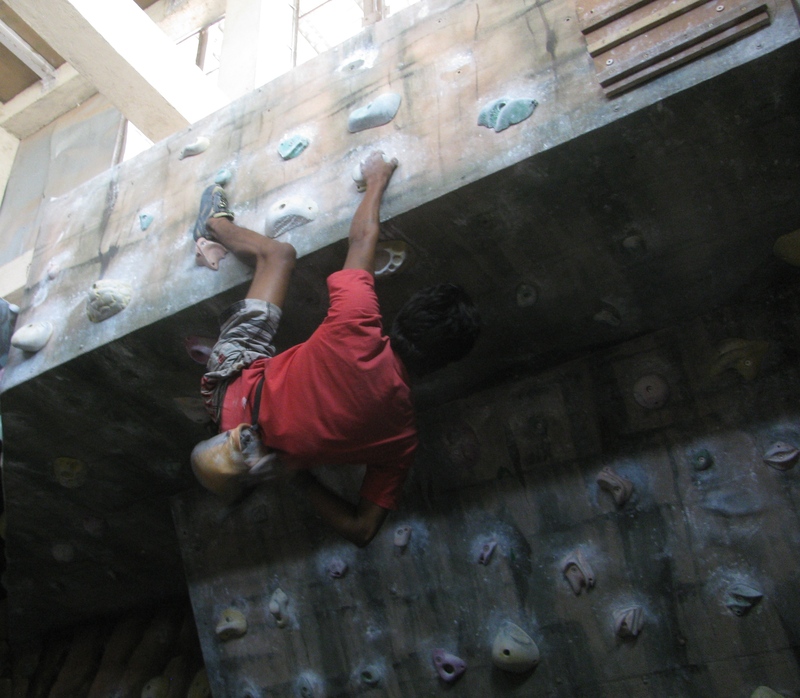 Sometime in middle school, he reached the PCMC wall for a week of climbing. 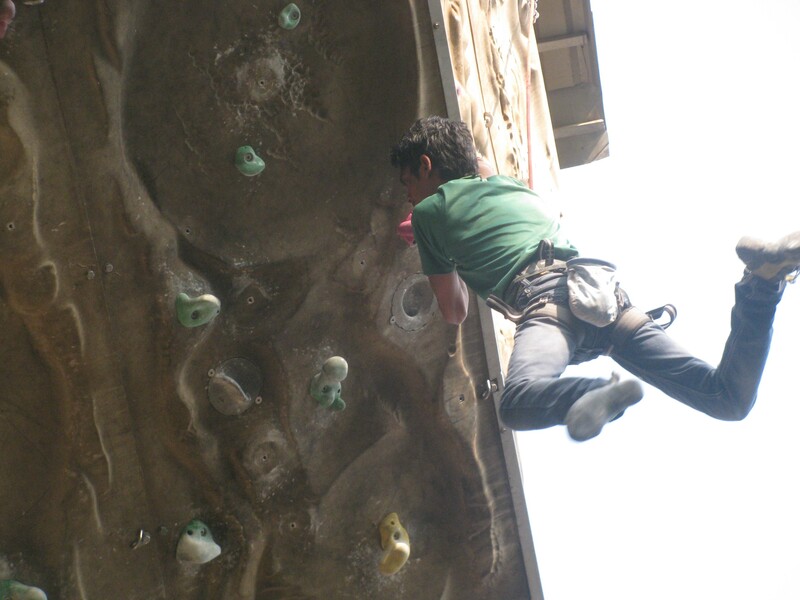 At its end there was an inter-school climbing competition and Ajij topped it in the under-13 category. One of the coaches at the wall, Sudhir Tambe, told him that he showed promise. But for the next two years Ajij, never returned. He was doing too many things – from yoga to athletics – and fitting the climbing wall into his daily schedule starting from home in Mahatma Phule Nagar was too tough. 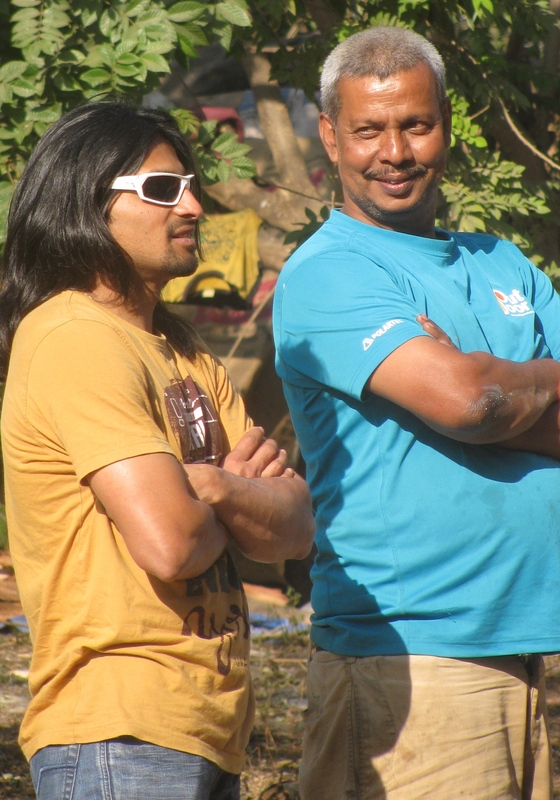 Ranjith Shinde, who was also coach at the PCMC wall, was the next person to remind Ajij to climb regularly. This led to a participation in the zonal competition. However it was after he finished schooling that Ajij got around to speaking seriously to Ranjith and expressed his intention to climb competitively. Unfortunately by then, the PCMC wall had closed. So he started climbing outdoors; this included the environs of Duke’s Nose (a prominent rock feature near Lonavala), the Plus Valley area and rocks near Ferguson College in Pune. There was also a small artificial wall in Pune, he could access. Rock climbing is done with special climbing shoes with rubber soles that generate adequate friction besides holding the foot in such a way that the climber is able to direct his power to the big toe. Ajij and his companions from similar underprivileged backdrop had none of these luxuries. He climbed with Fitness shoes, a tight fitting women’s shoe from Bata, which in appearance, resembled a climbing shoe. The lack of personal equipment made competitions attractive. Typically at events like the annual climbing competition held by Mumbai’s oldest mountaineering club, Girivihar, climbing gear was part of prizes given away. However with practically no personal gear, the prizes that Ajij and his friends won were never kept personal. They were shared with anyone from the group competing at high level and needing good equipment. In turn, this meant that wear and tear of equipment, like climbing shoes, was pretty fast. When it came to personal equipment, it was therefore like being on a treadmill. In 2008, Ajij reached his first nationals. It was his last year in the junior category. 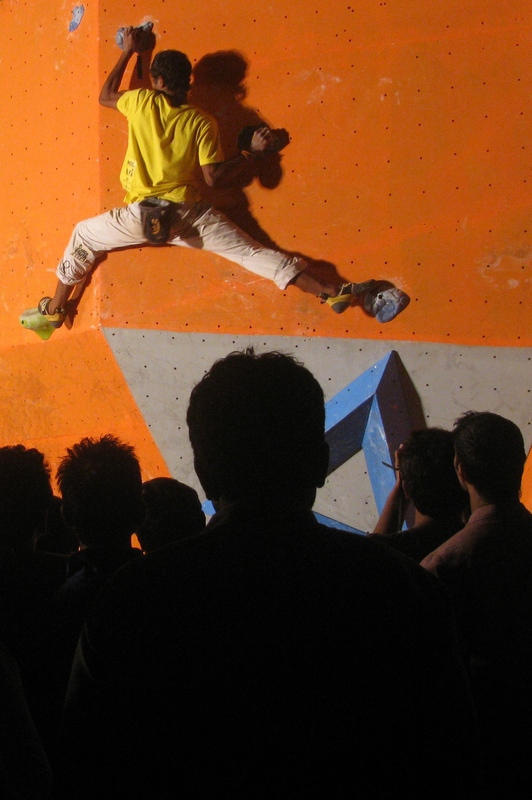 In Delhi, he saw Praveen C.M, a gifted climber from Bangalore, triumph in the senior’s lead climbing, speed climbing and bouldering competitions. Ajij was in awe of Praveen. He was also cast into a deeply introspective mood, which reminded him of his personal background and left him in tears. “ I cried,’ he said. Ajij was the eldest of three children; his father – now moved to Saudi Arabia – ran a small hair cutting saloon in Pimpri. He didn’t talk much of his family but when asked he admitted that they don’t quite know what climbing is or what he does despite trophies in the house. The family was poor. They lived in one room. Had things gone on as they do in such underprivileged circumstances, he would have been forced to quit studies by the seventh standard and seek work. Seventh standard was a Damocles Sword. Ajij thinks it was yoga that saved him. He travelled to participate in yoga competitions and that exposed him to places and people away from Pune. It helped him convince his family that he should remain at school, something useful when it came to his later interest in climbing. Such passing details gave me the impression that the 22 year-old had grown to being a bit of an island. According to Ajij, 2008 was his year of change. Among other things, he resolved to face his life thinking positively and figuring out how to improve his climbing, including fundamentals – he actually had a fear for heights. In 2010, the Shivajinagar wall was built. Ajij took up a job at the wall, looking after day to day operations. What it really did was keep him at the wall for long hours of practice. By this time, he was also focussed on only yoga and climbing having realized the value in pruning down many interests to a few he could properly handle. In between, to make ends meet, he worked with wedding caterers helping to serve food and clean up after functions; he also worked at private companies doing odd jobs like packing. In 2010, he came third in a competition in Mumbai. Then there was an open national competition (not the formal nationals, which requires selection through zonals) at Mussoorie, where Ajij was second and Praveen was third. 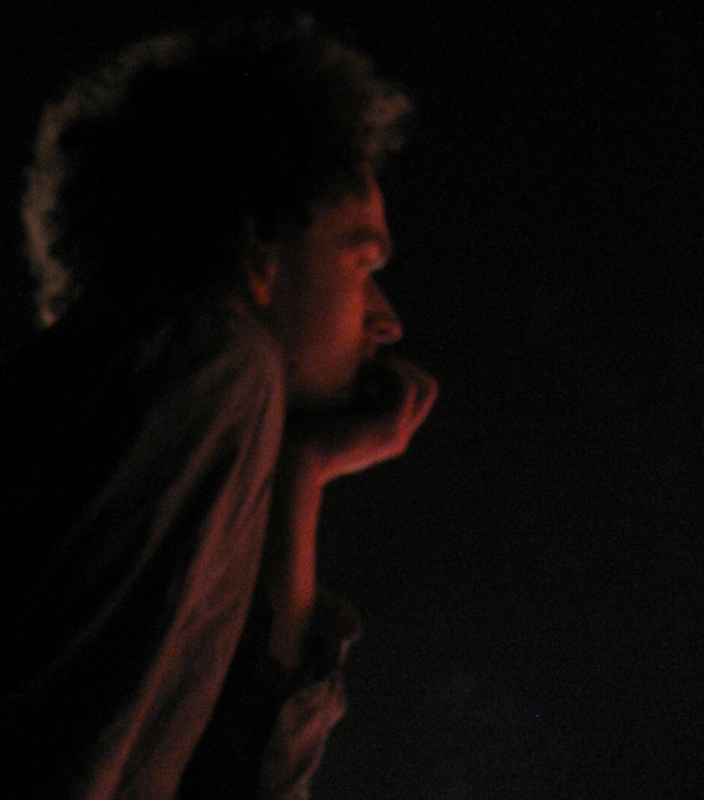 He smelled potential – he could do something. On return from Mussoorie, he intensified his practice. Besides practising at the Shivajinagar wall, including at the bouldering gym on the second floor inside the wall, Ajij also did extended endurance sessions on the granite wall near the old PCMC climbing wall. He qualified at the zonal competition in Bhopal and headed to Delhi for the nationals. In the initial rounds, he did badly and scraped through to the finals. Then he amazed everyone to emerge first in the senior’s lead climbing event. He repeated this triumph in 2011, 2012 and 2013 – making him a four time national champion. In 2012, Ajij participated in the World Championships in France. It was the first time he flew in an aeroplane, his first time overseas, including catching trains in France and reaching eventual destination; all this, alone. The experience overwhelmed. He arrived too late for one event and messed up his chances in the other. Managing France with no French and just some English to get by was difficult. Overwhelmed – was the word. 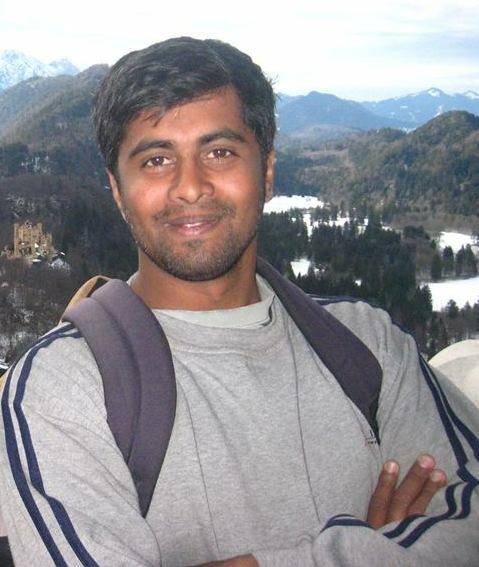 He breathed easy when Viraj Bhide, a climber from Mumbai studying in Paris, intervened. In 2013, Ajij participated in the Asian Championship in Iran. He hopes to travel to Spain in 2014 to participate in the next World Championship. According to him, he received no help from any sponsor, for these trips. Friends and others helped with money; he also borrowed. Later, he worked with outdoor companies to pay off what he owed people. “ I don’t have any regular sponsor. What I have understood is that you need to be set up for it properly,’’ he said, trifle bitterly. Ajij has a point. There are others who have managed to get support even though their ranking at the nationals in their respective sport hasn’t been first. In the youngster’s eyes, they had a good “ set up’’ and hence the progression to sponsorship. But there is also the angle that youngsters tend to expect more from the world without proper self assessment first. Thanks to proliferating media, the sport has become very brand driven. Top brands are coveted. “ A sportsman in need must be willing to go along with whoever offers support even if the brand that needs him is still a struggler,’’ a senior climber said. 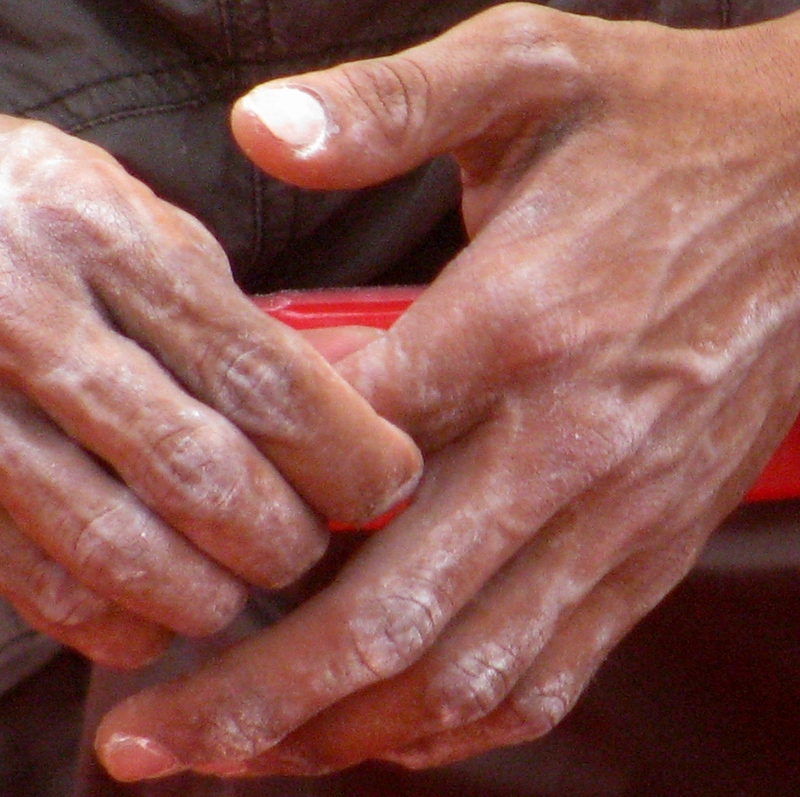 Interestingly, Ajij did make one observation – he does not feel comfortable with climbing as imagined by sponsors. He does not like the compulsion to prove because you have sponsor to impress. He would rather just climb. That’s spiritually close to the sport’s ethic and undeniably the purest approach. But it is likely impractical – at the very least, tough – in modern competitive sport. It can be circumvented only if the public domain is dynamic in financial assistance, which is doubtful. Not to mention – climbing itself is not prominent in India, gets easily misinterpreted and yet more than any other activity captures the idea of victory with its imagery of climber moving up. “ When we go abroad, we are expected to bring back medals. But people should understand the difference in resources and training between here and overseas. They must also understand that the more you travel around and compete, the more comfortable you become with the competition format. That is critical to perform well,’’ he said. This problem aside, what exactly did climbing mean for Pune’s underprivileged youngsters, now successfully pushing their names in sport climbing? We were all now sitting in front of the Shivajinagar wall. With the question of what climbing meant for them, the youngsters hit a wall; the sort of wall that thought typically runs into in a sport too action oriented to think. Does this regimen of action help you forget your troubles, the hard life back home? – I asked. “ That is probably true,’’ Vicky, who was sitting near Ajij, said softly. Vicky finished third in senior’s lead climbing at the last nationals. He has previously been national champion in junior and sub junior categories. Earning a podium finish at the nationals in his debut year as senior, he is considered to be a strong talent, somebody to watch out for. When I met Suresh, he too had felt that line of reasoning may be correct. 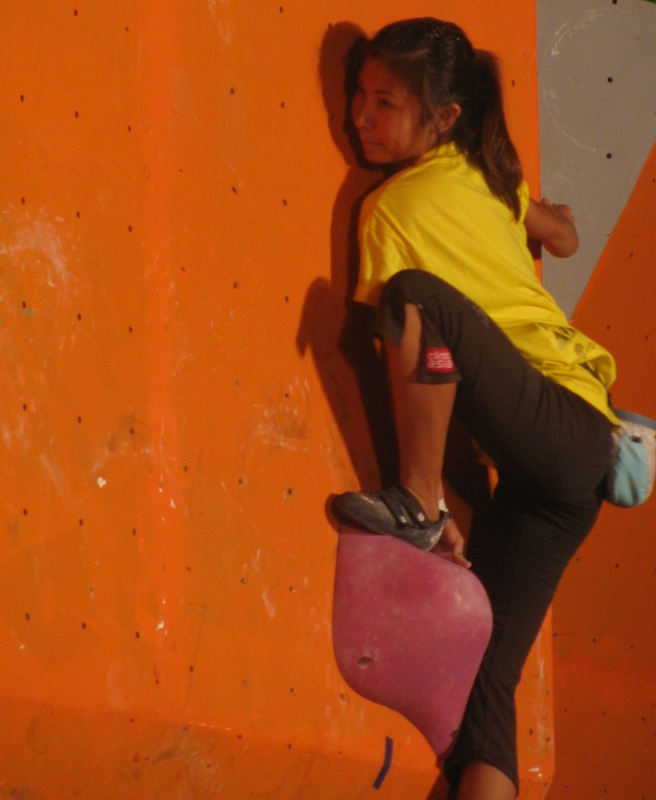 Being at the climbing wall and climbing helped you forget other depressing things. It kept you in the zone, you had fun. Suresh also told me of what happened to Somnath Shinde. 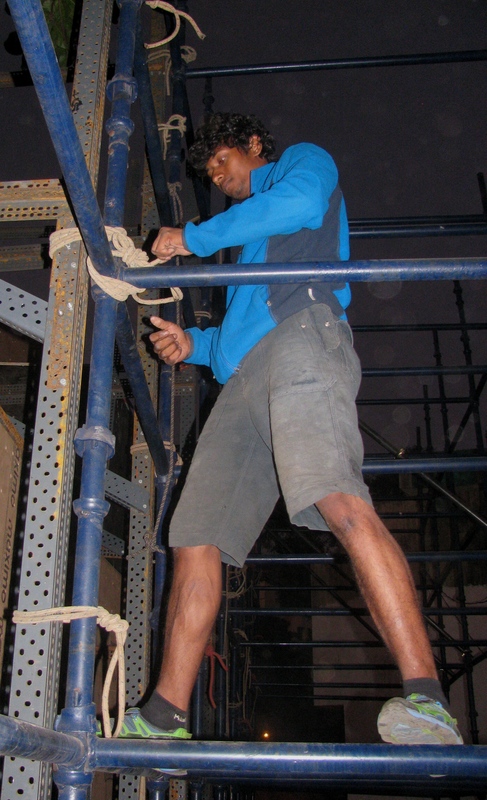 Working with an adventure gear company, Somnath used to help maintain a climbing wall at the premises of the Indian Army’s Bombay Engineering Group (BEG), in Pune. Soon he expressed a desire to join the army. His first attempt failed. He succeeded in the second attempt. Now he represents the army at climbing competitions. 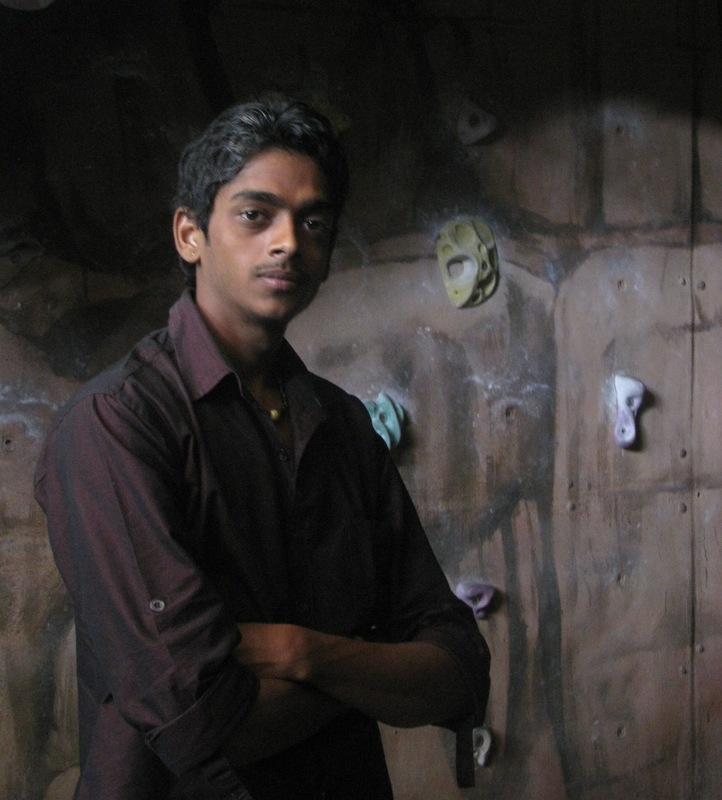 Similarly, another talented climber from the group, Indraneel, had moved to Surat, to manage a climbing wall at a school there. For the older Shrikrishna who along with Surendra imagined the PCMC and PMC walls, climbing faded from his life, prematurely. That’s the price he paid for devoting time to grow climbing. “ In the outdoor community, everybody wants to climb. Nobody wants to do the kind of work Surendra and I have been doing. If we had a hundred people ready to undertake such work, things would have been different and I would still be climbing. So the complaint that government does little for the sport is only partly correct. We are the ones who hardly do anything,’’ he said. That’s something to think of. 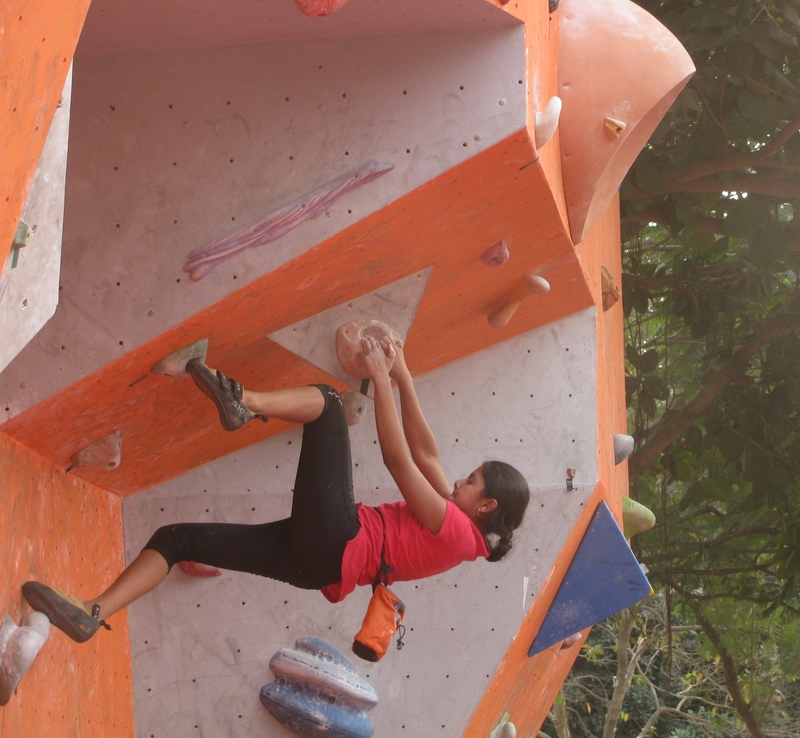 Please note: The 2014 Girivihar Climbing Competition concluded on January 26. This post pertains to preparations ahead of competition. It provides insight in this regard. Just after the regular updates, you will find a simple primer to understand how the competition format works in climbing. 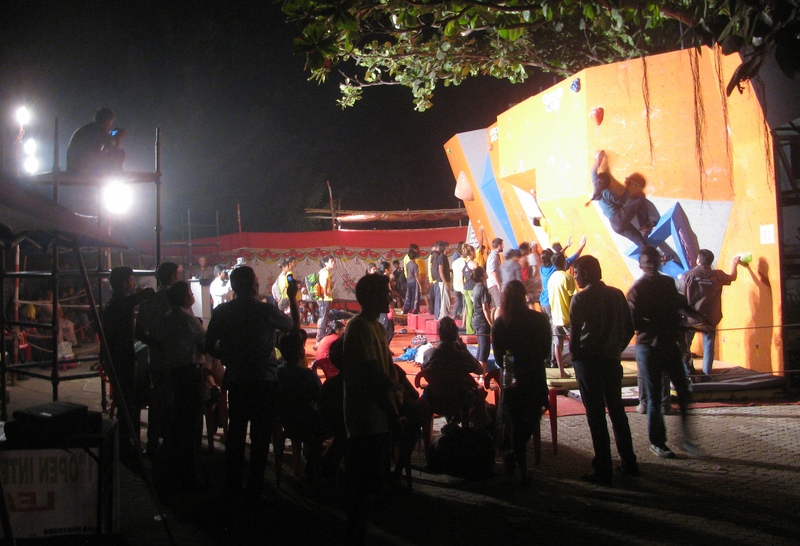 The eleventh edition of the annual bouldering competition hosted by Mumbai’s oldest mountaineering club, Girivihar, is scheduled over January 23-26, 2014, at CBD Belapur, Navi Mumbai. It is an open competition. As usual, the organizers expect participants from India and overseas. For more on the history and evolution of this annual event, readers can see the story ` A Competition’s Solo Climb’ posted on Outrigger in August 2013. Those wishing to participate in the upcoming edition should report to the venue on January 22. On January 23 and 24, you have the master’s round. January 25 is for amateur climbers. 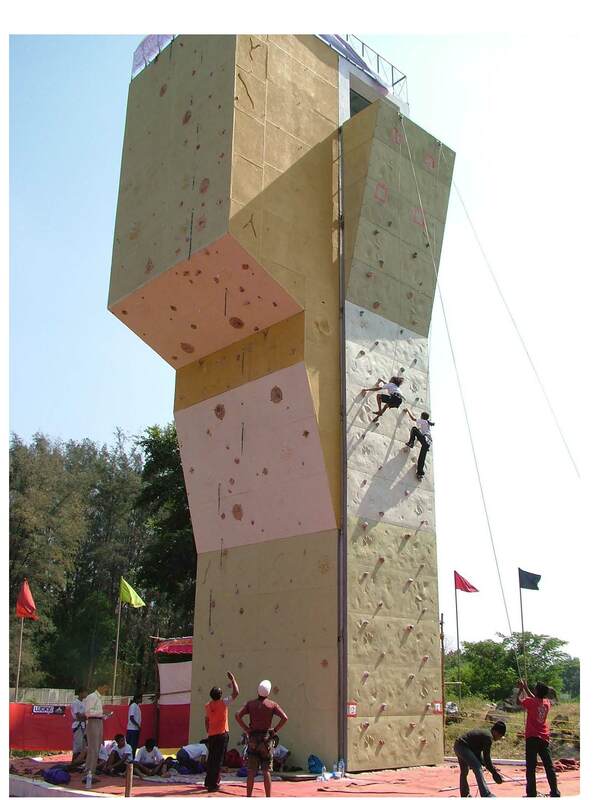 On the last day, January 26, Republic Day, the wall will be open for the general public to try their hand at climbing. This will be in the form of a workshop on climbing for citizens. 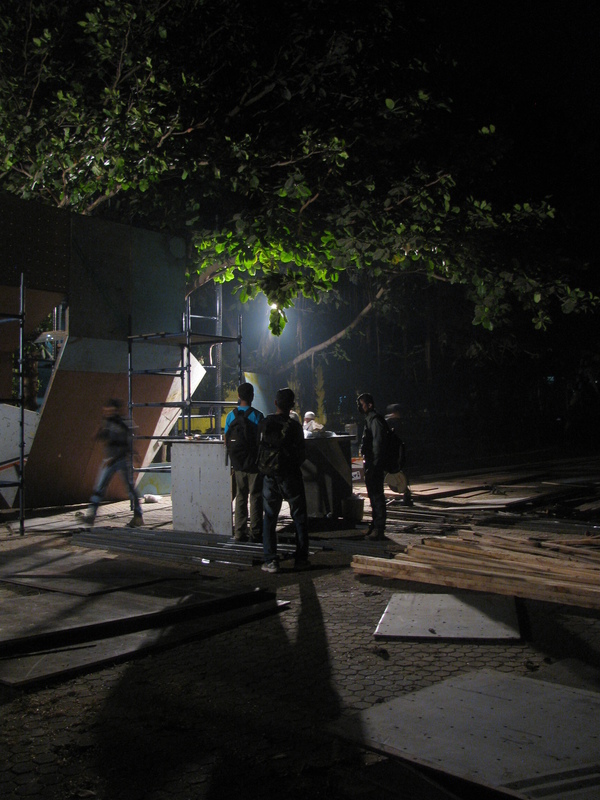 Work on this year’s climbing wall and other competition related formalities has begun (please see photos herein). Abhijit Burman, Franco Linhares and Vivek Thakur have become busy. Vaibhav Mehta should arrive in a few days. Rohan Gawand and Sandesh Palshetkar dropped by to help. 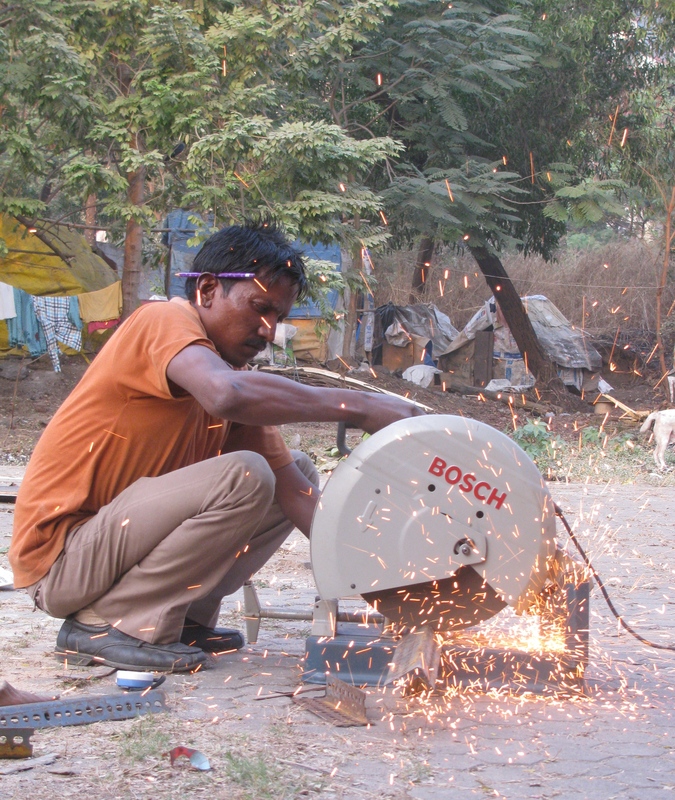 Update 1 / January 14: Tuesday was a day of festivals in India. According to newspaper reports, there were five happening at once. Early evening, the stadium near the competition venue at Belapur was in celebratory mood, hosting games ranging from cricket to kabaddi. 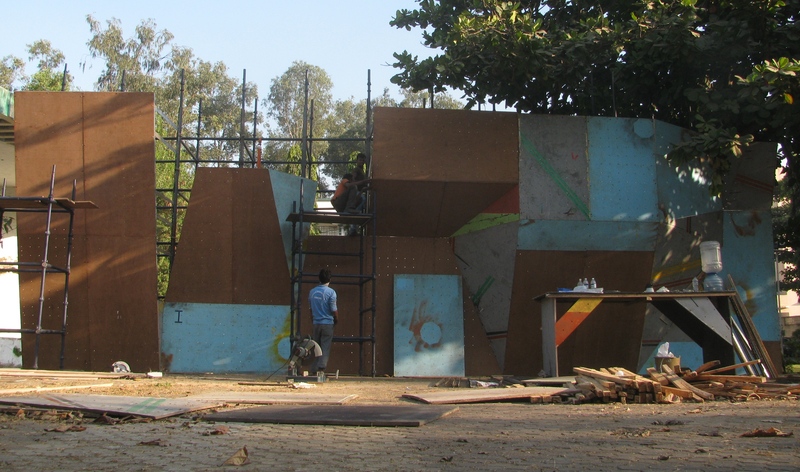 Amid that, work on the climbing wall continued. Abhijit Burman (aka Bong) was at the venue, as was Prashant Venugopal, who informed freelance journalist living out all days as same, that Tuesday was holiday. It added to the pleasure of meeting friends and the cups of tea, Bong handed out. The w all’s size is now clear from the framework built to support it. According to Bong, the wall for 2014 will be the biggest constructed yet for the Girivihar competition. It is marginally longer than what has been installed before. 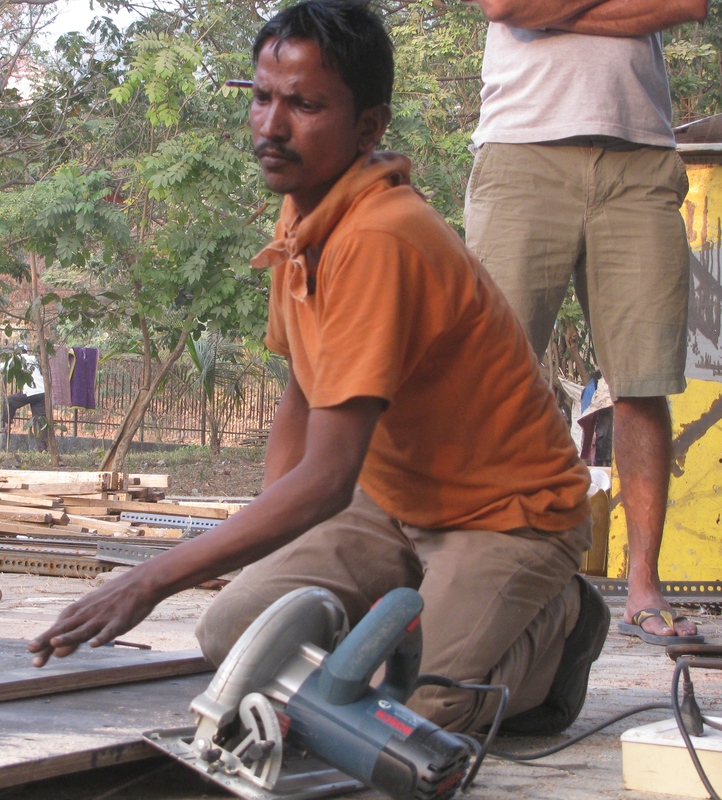 A familiar face to anyone who has witnessed the previous competitions is Raju, the carpenter. 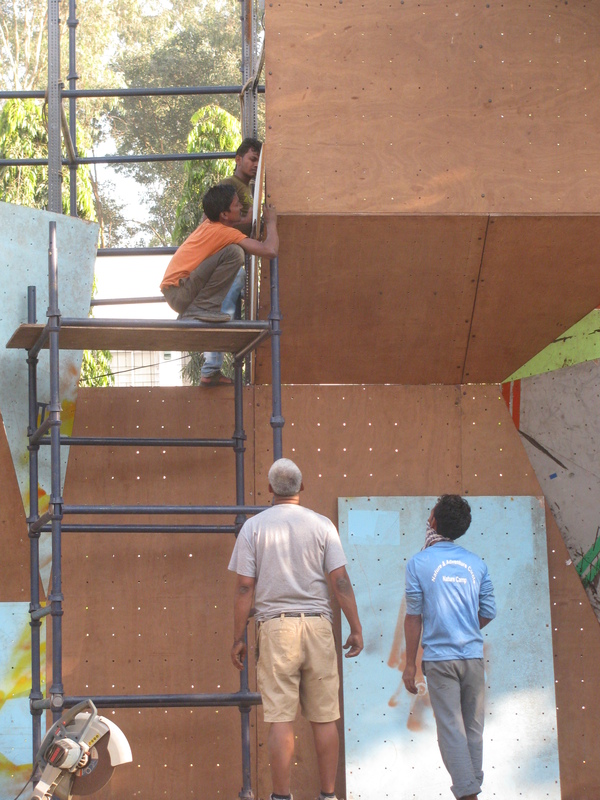 For the first few years, the wall was built in-house by climbers along with Bong’s architect-brother Indrajit. Slowly, as the overall work around the competition grew, carpenters arrived. 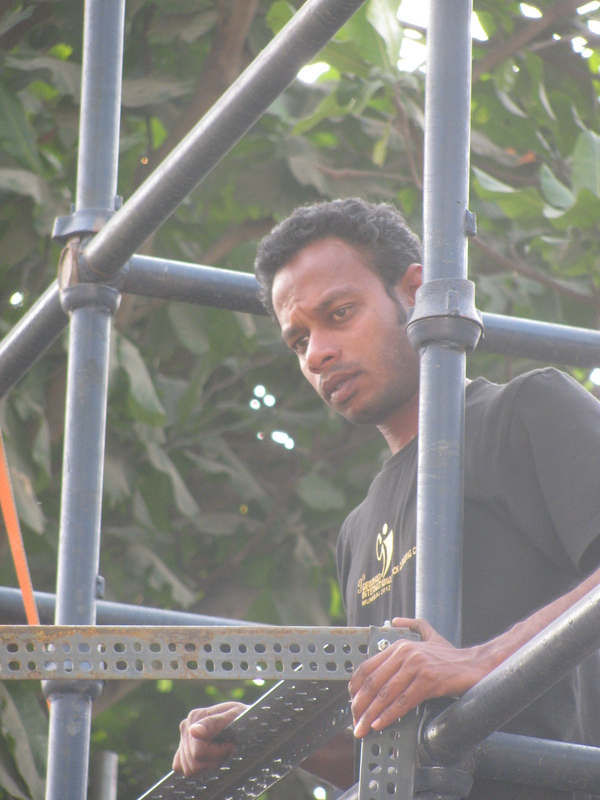 Raju, who hails from Chhapra in Bihar, first worked on the annual wall in 2009. From then on, he has been a regular sight at every edition. This time, he has two people to assist. On Tuesday, every tea break featured Bhojpuri songs played from the trio’s mobile phones. The wall-building work has got considerably mechanised. As sparks flew from the metal cutter slicing its way through a slotted angle-frame, Bong recalled how in the early years of the competition, all they had was the hacksaw blade and several blades broken every edition by a lot of metal to cut. Now, the shift to the venue ahead of competition includes all required raw materials to build the wall, an array of hand held machines for cutting and drilling and – a small kitchen installed next door to keep the tea and biscuits coming for those working. It may not seem much but eleven years ago, the entire event was just a thought in the head. 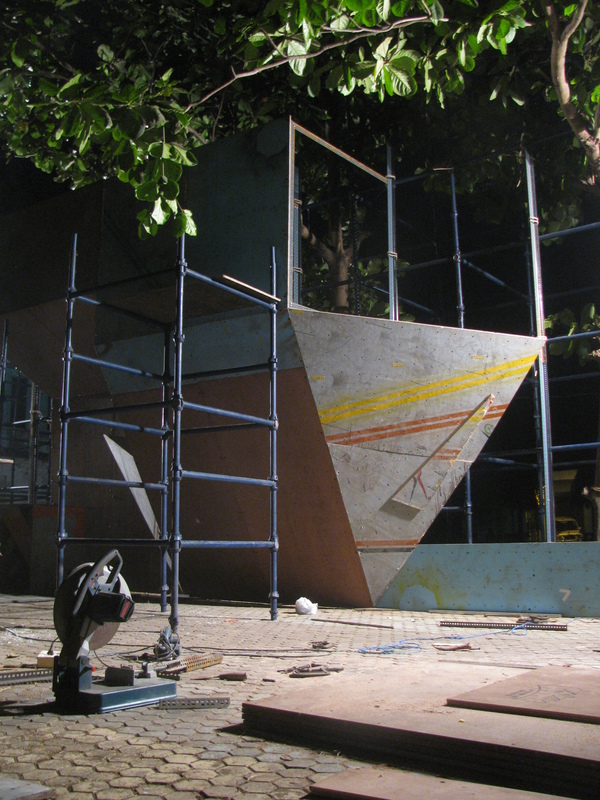 Old timers would recall Bong’s first house in Belapur, small in size and rendered smaller still by the climbing equipment – even a climbing wall – cramped into it. There, in the banter preceding and following the weekend assembly for climbing at the Belapur crags, the competition had taken shape. If I recall correctly, once formally discussed and cast as something to do, the first edition happened within a couple of months’ time. The response encouraged sufficiently to keep the show going year after year. Prashant had been one of those contributing to the prize money for the first edition. “ That is certainly one of the best investments I made,” he said. Update 2 / January 16: The wall’s shape is slowly beginning to unravel. About 60 per cent of its overall appearance – minus coat of paint – seems to be in place. 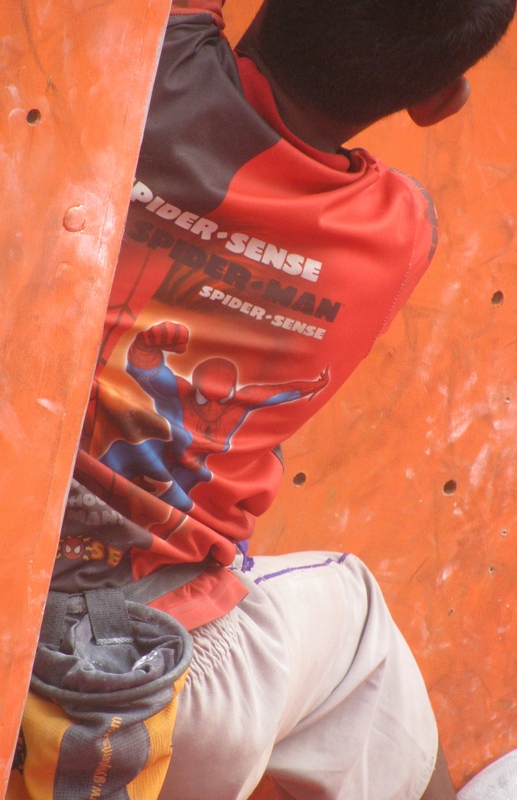 A climbing wall’s mind – what it uses to stump the climber with – is its holds, its features. Their shape, how they are placed and crucially, what type of hold or feature turns up where on given climbing route decide the challenge. So, 60 per cent overall appearance now visible at site, says nothing of what the prospective climbing could be. The route is a secret known only to the Chief Route Setter. Belapur awaits Vaibhav Mehta. Constructing the wall is hard work; both actually building it and the supervision of the task. I suspect, just as with mountain, few will remember these aspects. Ever heard of a mountaineer who pauses to wonder how the mountain came to be? Eventually, our wall too will be all about climber and to a lesser degree, climbing. Such is the human mind! Watching a wall take shape, that does make one feel trifle sad. January 16 felt another typical day at the wall. The core team was there; Franco till late afternoon, Vivek Thakur arrived late evening. Bong is permanent fixture as is Raju, the carpenter and his team. For freelance journalist, time was marked by catching up on old stories and discussions about life (the world according to middle aged climbers! ), periodically interrupted by quick fire exchanges between Bong and Raju. Thus, slowly but steadily, with much fun and banter in between, the wall comes up for what it hopes will be a good response to the competition, from climbers. Update 3 / January 17: Work on the wall has progressed well. The facade was nearing completion as of late evening. The painters were set to take over, next day. Once the wall’s front face is fully up, the building team will busy itself providing more structural strength through slotted angle-frameworks for roofs and other panels besides more linkages between the wall and the scaffolding behind. When it started years ago, this annual Girivihar competition was wholly on natural rock. The climbing crags of Belapur are located along the slopes of an amphitheatre of hills. This is where the bulk of the club’s weekend climbs used to happen. 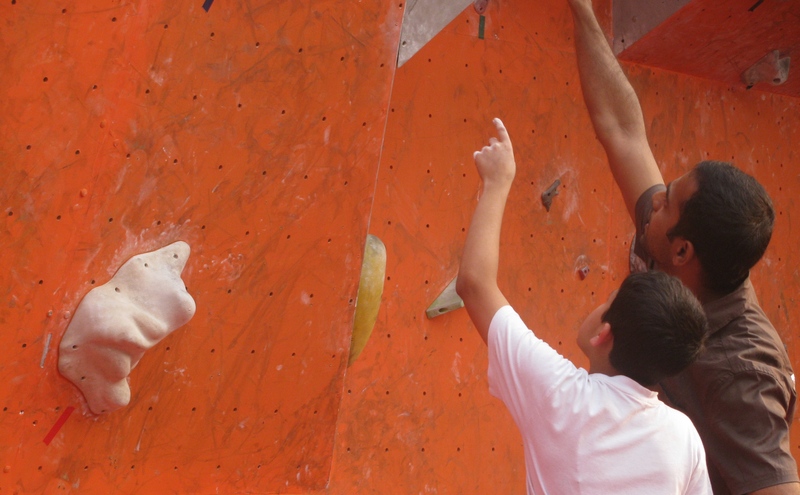 It is also home to the club’s annual rock climbing camp that trains newcomers to the sport. Both arms of this arc-like landscape were tapped for rocks to climb, later compete on. On one occasion, the competition stepped out from this area to the nearby Khargar hill road as well. But that was just once for an impressive route there couldn’t be availed again. 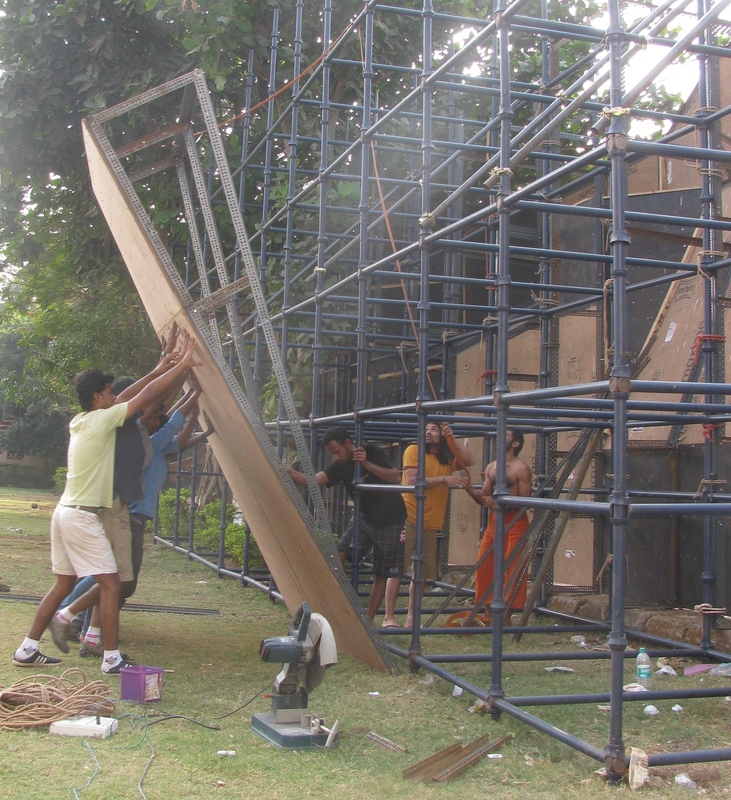 A few years into holding the competition, the first set of artificial walls for the event made a shy debut. They were housed indoors and if I remember right, were held in place with ropes. Soon, these walls transitioned to not just being located outside but they also replaced natural rock to be the prime medium for the competition. The structure of these walls betrayed the competition’s home grown flavour. 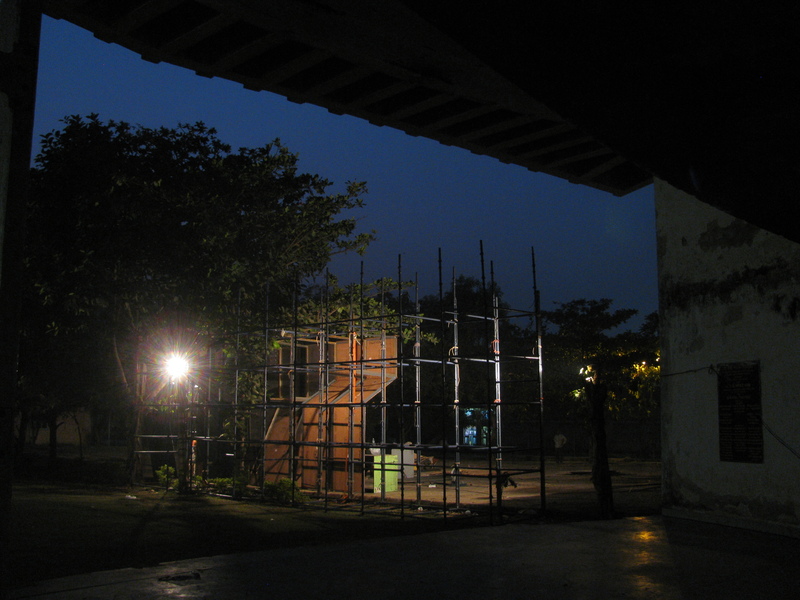 The wall was mounted on a framework of slotted angles but it was held in place by bamboo scaffolding. Amid climbing sessions, rope and bamboo tended to loosen. It required tightening. The lack of elegance did nothing to dampen the competition (national champions, strong climbers from overseas and even a world champion visited Belapur to climb or set routes during this phase). But tightening the bamboo structure wasn’t fun. Bamboo gave way to steel framework. While all this may seem trivial, for a home grown competition, each change meant rethinking funds and finding ways to make scarce money happen. 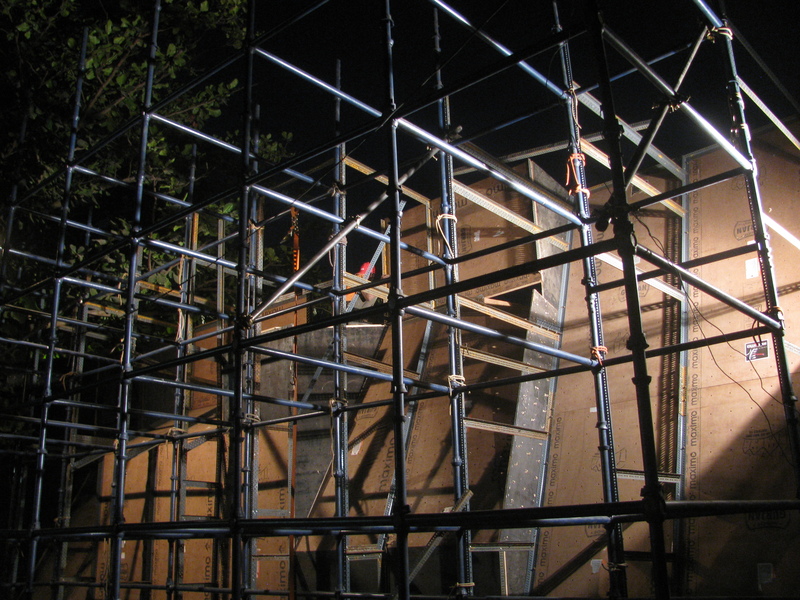 The next stage was to graduate from renting the steel scaffolding to owning it so that recurrent cost in every edition of the event was contained at least to that extent. In this, Mangesh Takarkhede, who had been winner in the competition before, helped. Today, it’s a presentable grid of metal behind the wall. For Girivihar and climbing in Belapur, the annual competition is a get-together of climbers, a reaffirmation of the joy in climbing. Befittingly therefore, Vinay Potdar, Sandeep Maity and Rahul Ranjan reached Belapur early today (January 17), from days spent climbing in Hampi. By evening, Sandeep Bhagyawant, Rohan Gawand and Vivek Thakur arrived. Franco, at site since afternoon, stayed busy liaising with local authorities. Shantanu Pandit dropped by. So far, everything has been on schedule. Update 4 / January 18: You could say the wall is ready. For the wall-building team, only minor structural work remains. The painters have given the facade an initial base layer. Colours are yet to come. Late evening when the painters left, the wall was white; like climbers’ chalk. This is the first time in the history of artificial walls at the Girivihar competition that work on a wall has concluded this early, ahead of schedule. “ We began work earlier than usual,’’ Bong said. Now it is up to those executing the remaining jobs to maintain that efficiency and sustain the relatively relaxed atmosphere. Needless to say, smoothly working systems make the competition enjoyable. On the stage adjacent to the venue, was a collection of crash pads, neatly stacked. 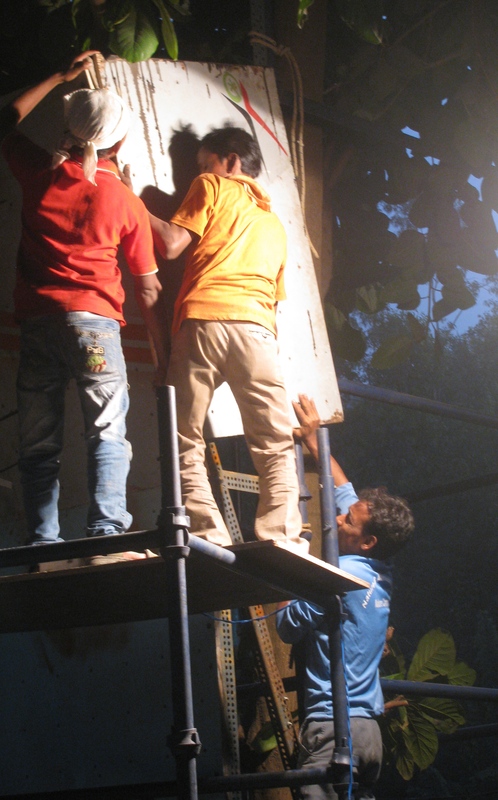 Thanks to Ajith Bhobate, they were moved here today from the Poddar College climbing wall maintained by Girivihar. More such pads are due; they are used to cushion falls from the climbing wall once the event gets underway. It is that time of the year when crash pads catch taxis, suburban trains, squeeze into three wheelers and ride pillion on two wheelers – to be useful in Belapur. Update 5 / January 19: I guess today, despite the wall gaining colours, it should take a back seat. 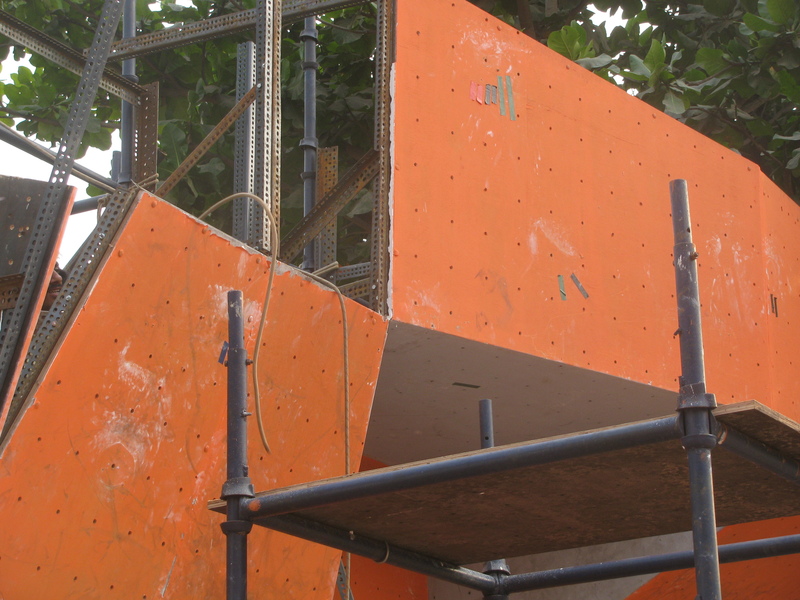 When the first edition of the Girivihar climbing competition was conceptualised over a decade ago, it was in no small measure due to the rise of a new generation of climbers in Mumbai. They embraced sport climbing. That lot was headed by Vaibhav; other prominent names were Sandeep Varadkar, Shyam Sanap and Mangesh Takarkhede. Not only did they push sport climbing, they were also so fiercely given to climbing that it was pretty much what they did for main activity. Suddenly, climbing wasn’t merely hobby. Bong, a technician by profession, was willing to piece together the competition’s infrastructure. 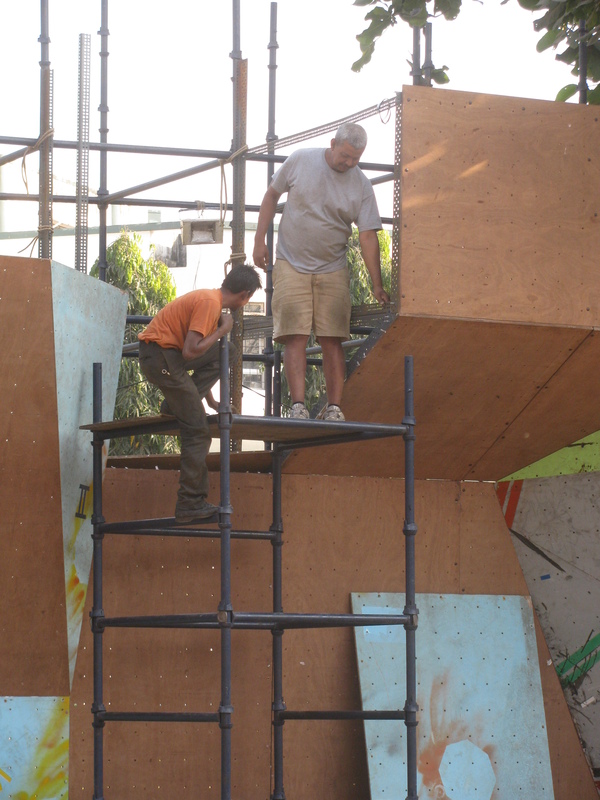 These climbers brought the passion and critically, the attraction for others of their generation to turn up in Belapur. Vaibhav –he ran a climbing gym in Leh (Ladakh) for a couple of years – now lives in France, a country strongly identified with climbing. He is the competition’s Chief Route Setter. His old friends – Sandeep, Shyam and Mangesh – turn up to work alongside at the annual competition. Like Bong, Vaibhav and Co has been another building block of the event. The wall will understand if I said that the wall isn’t main news today. That would be: Vaibhav is here. As for the wall – its facade has been painted orange, grey and blue. Also arrived today, were more crash pads and several plastic bins filled with climbing holds. Meanwhile, the team of club members who will manage the show got around to discussing other aspects vital to the event, ranging from registration formalities to accommodation. Update 6 / January 20: The photo says it all. Late evening; a climbing wall painted orange, grey and blue shines under arc lights. It gleams impervious to crunch hour approaching. There are pending tasks; that inevitable last minute rush to face. The drift to upcoming competition is now palpable. Update 7 / January 21: The day began with worry. Coming to think of it, yesterday (January 20) had been cloudy. If I remember right, the sun never broke through. But who would anticipate rain in January in Mumbai? They wouldn’t have in Belapur. What’s happening to the orange wall? – I thought. A shy sun is out in the sky. The wall was as orange, grey and blue as ever. Pretty much the same as it was last night. The team got the warm up-wall in the isolation area, ready. That will be used by climbers waiting in isolation for their names to be called out to emerge and climb. A warm up-wall keeps them going. Late evening, work on setting up all the boulder problems required for the various stages of the competition got underway. Watching it was an engaging experience. It reminded me of days in climbing gone by. A set of portable speakers played wonderful music. Chief Route Setter, Vaibhav and his team stayed intensely focused on their task; the music amply aiding the creative yet acutely action-oriented atmosphere. They set routes, attempted them, discussed difficulty levels. Once a problem has been finalized, the climbing holds used to make it are removed and the wall returned to its original look. But because the boulder problems so designed must remain confidential until disclosed for competition and since problems in the making can give away information on how to climb them, we have no photographs of the wall’s facade today. Its the wall’s Houdini Phase; there, yet not there – disappeared! Update 8 / January 22: Relatively peaceful day, despite it being eve of competition. Outstation participants have begun arriving. A few had landed on January 21. By 8.30PM today, 25-30 competitors had registered, mostly for the Master’s category. There was dinner for all at the venue, including the participants who have reached Belapur. The competition management team held a meeting. Specific responsibilities – ranging from judging to cleaning holds, spotting and supervising isolation – were allotted. As mentioned earlier, the first set of boulder problems were prepared on the wall, January 21st night. A boulder problem once approved is documented and removed. 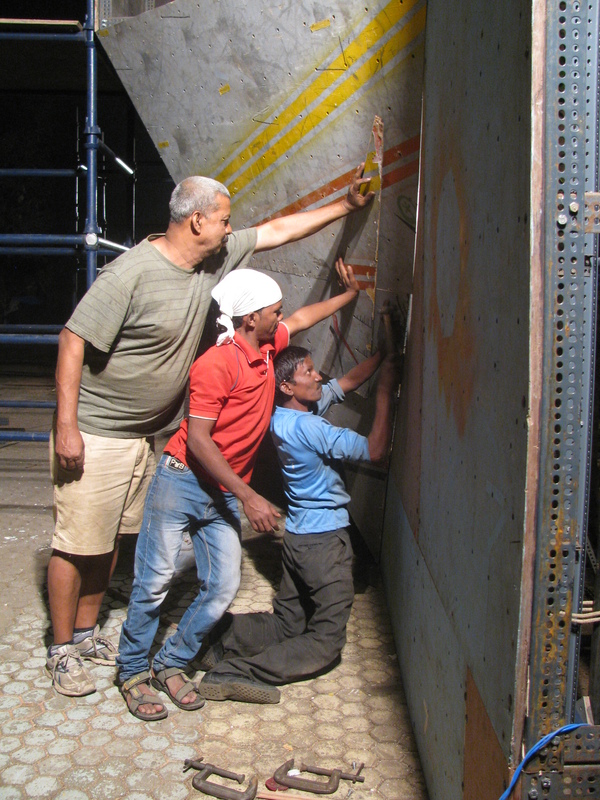 Tonight, after all the participants have retired to their rooms, the wall was slated to come alive again, as the Chief Route Setter and his team continue their work. That wonderful music would be back, the climbing shoes would be out, hands would be chalked and a bliss hold-to-hold would descend. The competition begins tomorrow, January 23. Before I sign off, a photo of the wall, clicked late evening today when participants were allowed to be there for registration and dinner. This photo was taken with the Chief Route Setter’s permission. Good luck for the competition and happy climbing! 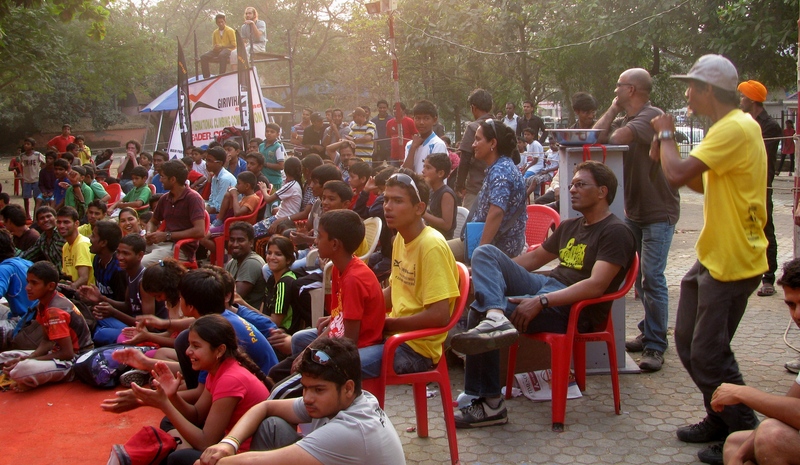 The Girivihar competition has two categories in the main – women and men. The event starts with these two groups in mind and evolves separate sub-categories based on age (under-sixteen and above) depending on the number of participants. If a potential sub-category has too few participants, it gets merged with a suitable another. 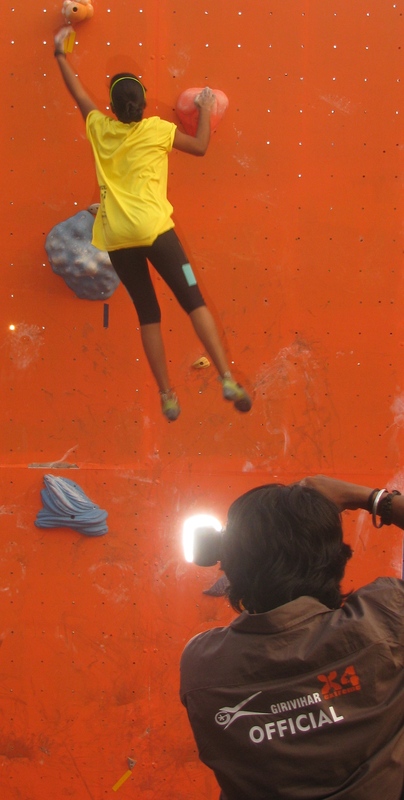 A climbing competition on an artificial wall (like the one at the Girivihar event) typically involves tackling a boulder problem that has been designed by the route setter. To retain the element of surprise and newness, every round of competition begins with ` isolation.’ Akin to extempore speech contests, when you are taken aside, given the subject and told to prepare your speech in five minutes, here, the competitors sit in isolation away from the wall while the route is readied. This is followed by the chance to observe / study your route before you climb; it happens differently for the qualifying rounds and the finals. In the qualifying rounds the acts of observing / studying a route and climbing it, get clubbed together. You do it at one go, emerging from isolation when your name is called, observing the route and then attempting it. However in the finals, participants come out together from isolation to observe the route, then return to isolation and emerge one by one to climb. 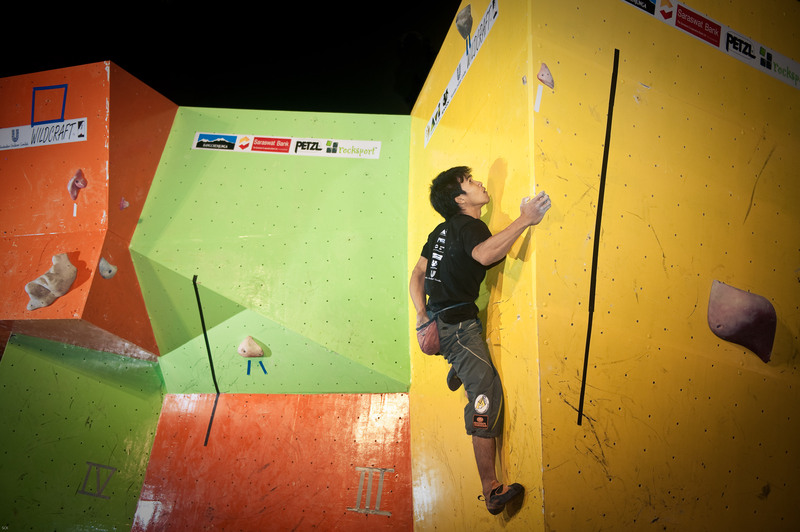 In the finals, the two acts of observing / studying a climbing route and climbing it, are treated distinctly. The wall is composed of multiple faces and each face has a route to be attempted for participant to formally finish a full round of attempts. Therefore, he / she is entitled to five minutes of climbing a face on the wall followed by five minutes of rest before attempting the next face. The ability to tackle a route is a combination of how well you imagine it in terms of climbing moves in your head and how well you actually execute the plan you conceived. Therefore, when more than one competitor is out in front of the wall, the one taking rest has to sit facing away from the wall. This is to ensure that the one taking rest does not see another competitor climb a route he / she is expected to attempt. In the finals, since there is separate time awarded to observe / study each face, the time participants get to climb is regarded as four minutes plus. That `plus’ runs for as long as the participant takes to finish his last attempt begun within assigned time limit. 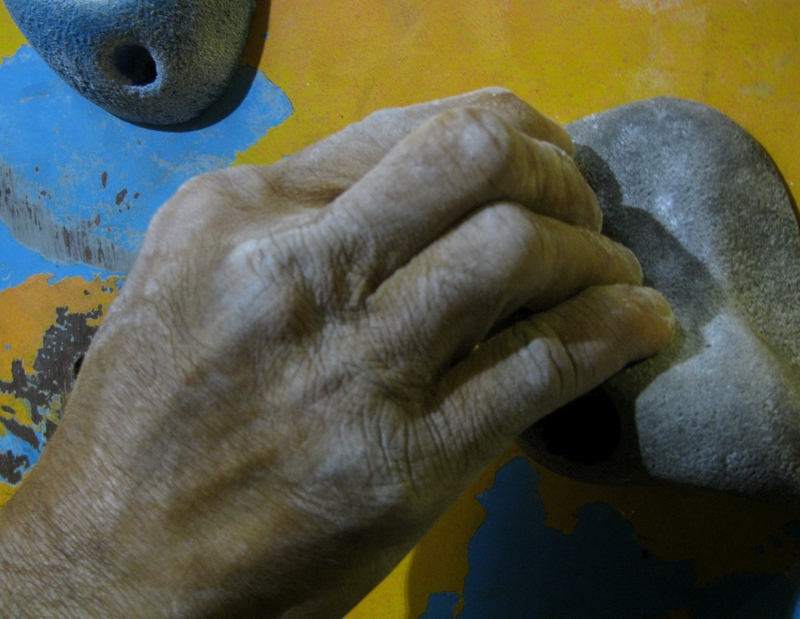 When climbers are observing a route, you will often see them move their arms and imitate grips with their fingers, as though engaged in a climb. This is done to physically ingrain / memorize the sequence of moves, they figured out by observing with their eyes while still on the ground. 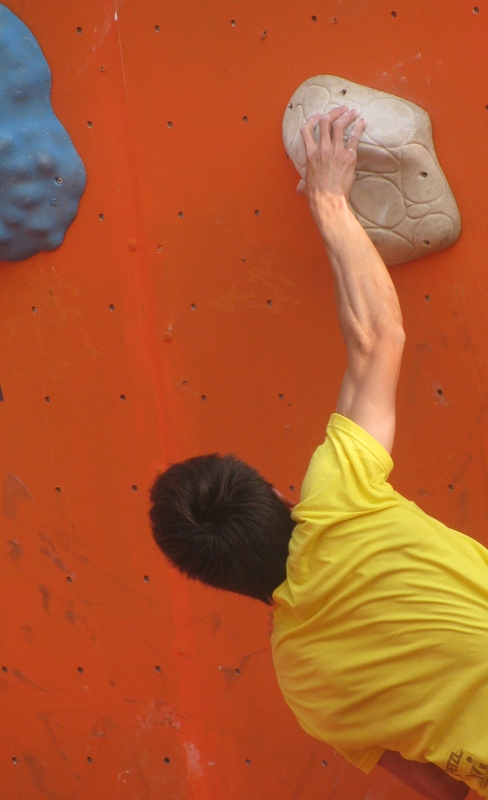 Once the participant emerges from isolation to climb, he / she is considered to have started climbing the moment a classic three point-contact with both feet off the ground, happens on the wall. This is noted as one attempt. The participant can have any number of attempts within the allotted time. While the above are the basic rules, from the judges’ perspective, when the competition gets intense or climbers are evenly placed, smaller details will matter profoundly. For example, how many attempts you took to climb a route, how far you reached on a route – all this and more will be factored in for distinction. An interesting angle herein is the use of the `zone’ concept. Under this, on some exceptionally difficult routes that participants are struggling to finish, a participant, while unsuccessful at gripping the final hold and moving up, may manage to touch the final hold and keep his / her fingers there for a while to establish how far he / she reached. In the last edition of the Girivihar competition, there were climbing routes ranging in difficulty from sub-6 to mid-7 on the French grading scale. There is never prior indication of what to expect in terms of grades at a competition as that is a dynamic equation between the Chief Route Setter and the calibre of participants. The Chief Route Setter gauges the gathered climbing talent and improvises accordingly. That said, grade itself is a funny thing; it tells you much of the science climbing has become (with its ability to award numbers to difficulty) and how relative (art – you could say) it still is for the numbers are a matter of perception. Thus, once a route is designed, the Chief Route Setter and his trusted team (in other words – more than one person) attempt / climb the route for a feel of what it is. Together and after adequate deliberation, they assign grade. Equally, once a route of challenging grade has been climbed many times over, it is not seen to retain its original grade. On natural rock, this degradation is even physically tangible in the form of accelerated weathering of tough holds into easy ones, courtesy several climbers passing through. On artificial walls where holds can be replaced, it is more a case of the how-to-do knowledge becoming available. This how-to-do element is referred to in climbing parlance as the `beta’ of a route. The above is a simple guide to understanding how a climbing competition works. The proposed citizen’s workshop of January 26, the last day of the 2014 Girivihar Climbing Competition will be a useful programme to attend for more on this subject and plenty more related to climbing. HERE’S A STORY, ORIGINALLY WRITTEN IN 2011. IT HAS BEEN UPDATED TO PROVIDE LINK TO MORE RECENT TIMES. At a concert organized by the Mumbai-based Khayal Trust, Pandit Venkateshkumar took the stage. A Hindustani classical vocalist, he was assertive, subtle, strong and delicate, the discerning use of these abilities making his interpretation of compositions, engaging. I can’t identify raagas; I simply like or dislike music – any music – as aural experience. In the outdoors, I have tracked rivers – from relatively calm flow in the foothills to turbulent upstream and almost inaudible trickle at source – noticing how their character changes. Venkateshkumar’s singing had something of that. He seemed to be singing from a bigger understanding of subject and not merely indulgence in the specific; it wasn’t a section of the river amplified ignoring the whole, it was the whole. On stage, neither was his support crew behaving like sycophants unto him nor was he synthetic in his encouragement of them. A singular chemistry prevailed – chemistry by music. No drama, no playing to the galleries – the proof of the pudding was my brain, soothed to peace; a connection to its home – the universe – made. This was the second time I heard Venkateshkumar and the first time I was inside the auditorium when he sang. The previous occasion had been a well attended modest sized gathering in the Mumbai suburb of Chembur. The venue, mere hall and no sophisticated auditorium, was filled to capacity. Chairs outside had also been taken. People stood patiently; listening as attentively as they would, had they been on a seat within. I joined them. Why should anything else matter if the music is good? The first time I met Venkateshkumar was before I heard him sing. Along with good friend Latha Venkatraman, a journalist who has learnt classical music for many years, I was exploring a story in northern Karnataka, way south of Mumbai. On January 24, 2011, Pandit Bhimsen Joshi passed away. With that India lost its most famous voice. His was a mad, rough edged-reaching out; different from other contenders to be India’s voice and certainly quite apart from that other tradition of Indian classical music – Carnatic. I like to let go (it is also what I find most challenging and what I do the least). In contrast, Carnatic seemed perfect and deliberate, a sort of antidote to madness. Bhimsen Joshi hailed from Gadag, next door to Hubli-Dharwad in North Karnataka. Born there, he was bitten by the music bug, travelled through India in search of a guru and was finally directed to Sawai Gandharva in nearby Kundgol itself. The rest is legend amply conveyed by the great man’s music. What intrigued me was Hubli-Dharwad. Music lovers there sometimes called the place a LOC (Line of Actual Control) between Hindustani music and Carnatic. Yet within Hindustani classical, it is unique for not only being the southern outpost of the tradition but also, a reclusive, defiant, academically inclined ambience that cares more for dedication and purity than the market. Geographically the region bridges that portion of Karnataka which is home to the wet, green hills of the Western Ghats and the start of the Deccan plateau with its imposing flatness. 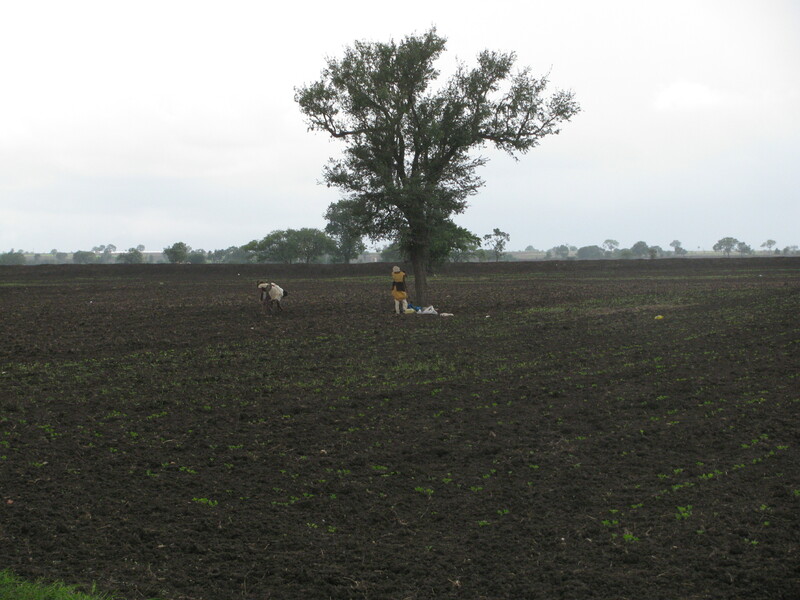 To one side, in the rainy season, the lush vegetation is so pronounced that it contrasts crops like cotton and chilli, typically associated with frugal water intake, grown on the other side. The Hubli-Dharwad region, once part of the Vijayanagar Empire, was subsequently in the possession of rulers from both Karnataka and Maharashtra. Until 1955, it was part of Bombay Presidency. Hubli, the commercial hub of North Karnataka, is a major cotton market and centre for a variety of agricultural produce. At the vegetarian restaurant of Ananth Residency hotel, I asked for North Karnataka food. It wasn’t available; recommended instead was “ Veg Rajasthani,’ something possibly evocative of the region’s place in trade. The leading brands of Dharwad pedha were Thakur and Mishra, neither of them surnames indigenous to the area yet now synonymous with pedha. Hubli was also where the typical motifs of Indian urban life were taking hold. There were shopping malls, stores with walls of flashing TV screens, ATMs and hotels. Then another LOC of sorts divided it from Dharwad, 20 kilometres away. The local transport bus took you through a busy road with 40 kilometre-speed limit. Approximately three quarters of this travel done, at Navalur as people would later tell me, the atmosphere changed to charming old world flavour. You entered Dharwad. As pronounced as Hubli’s commercialism, was Dharwad’s conservative, academic tenor. Its prominence in history was as an educational hub, the place where people from North Karnataka, Goa and Southern Maharashtra came to study. 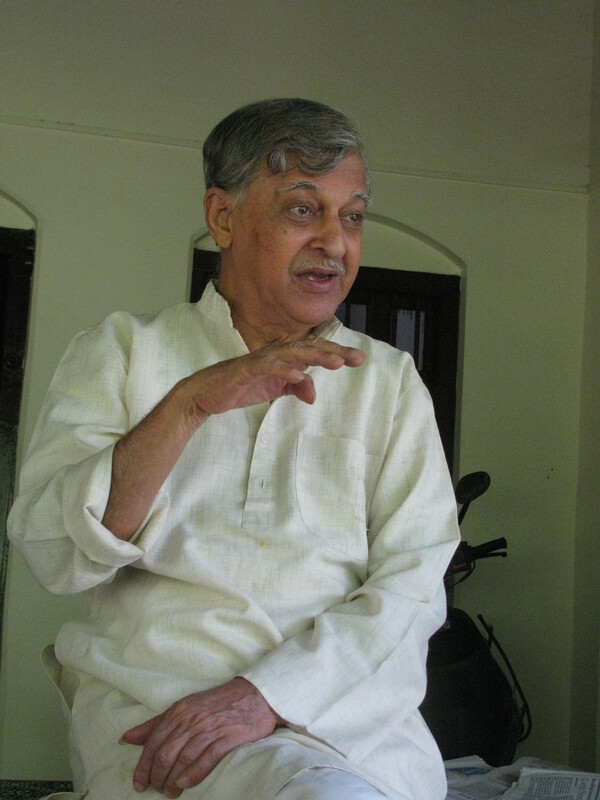 According to Ramakant Joshi, Editor-Publisher, Manohara Granth Mala, it was Dharwad’s educational backdrop along with an existing culture of theatre and literature that provided a fertile substratum for Hindustani classical music to flourish. The office of this publishing house founded on August 15, 1933 (those days August 15 signified the birthday of Sri Aurobindo) was lined with Kannada books and located in an old room above Subhas Road. Ramakant Joshi is Bhimsen Joshi’s cousin. Unlike in Hubli, in Dharwad, you found shops that hadn’t changed for decades. 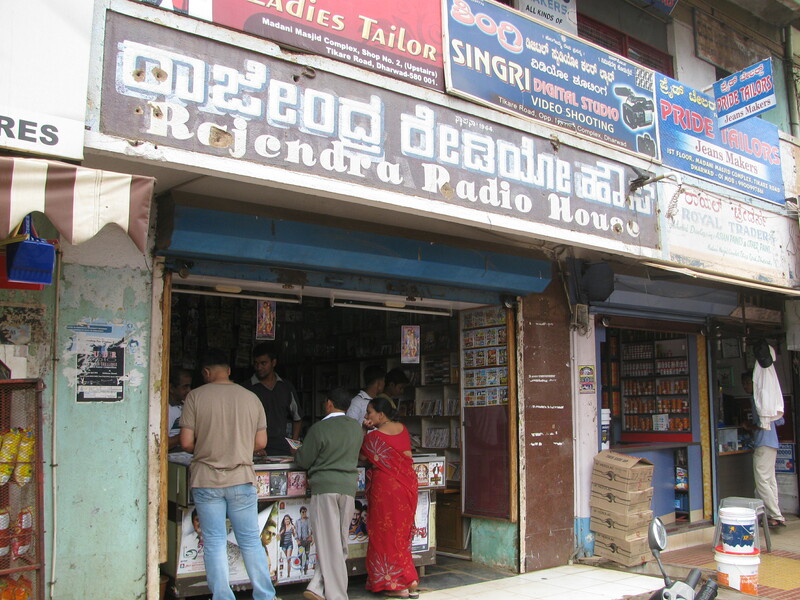 You bought classical music CDs at Rajendra Radio House, run by Basavaraj V. Kotur, who informed that the shop started in 1964 had been one of the first four music stores in Karnataka. Only two shops from that four remain. There was also relevant change – the Srujana auditorium, where many concerts are held, had been refurbished with help from Nandan Nilekani, former CEO of Infosys and currently chairman, Unique Identification Authority of India (UIDAI). Dharwad looked peaceful, there was plenty of greenery and the people you spoke to had a conservative demeanour but amazed by their quiet erudition on chosen subjects. Here a musician or music lover might confidently tell you that he or she is known in the neighbourhood. As we discovered, that wasn’t always true but it was a measure of how comfortable you could be, pursuing the classical arts in this town. Neela Kodli was easy to talk to. In between she went to the kitchen to make tea. Like many of us she hummed a tune, except it was a classical composition. Neela Kodli is the daughter of Mallikarjun Mansur. A singer in the shadow of a famous father, she was modest about her abilities. The Vijayanagar Empire had a strong role in the evolution of South India’s Carnatic music. The famous composer Purandara Dasa was born in modern Shivamoga district and spent his final years at Hampi, next door to the Hubli-Dharwad region. 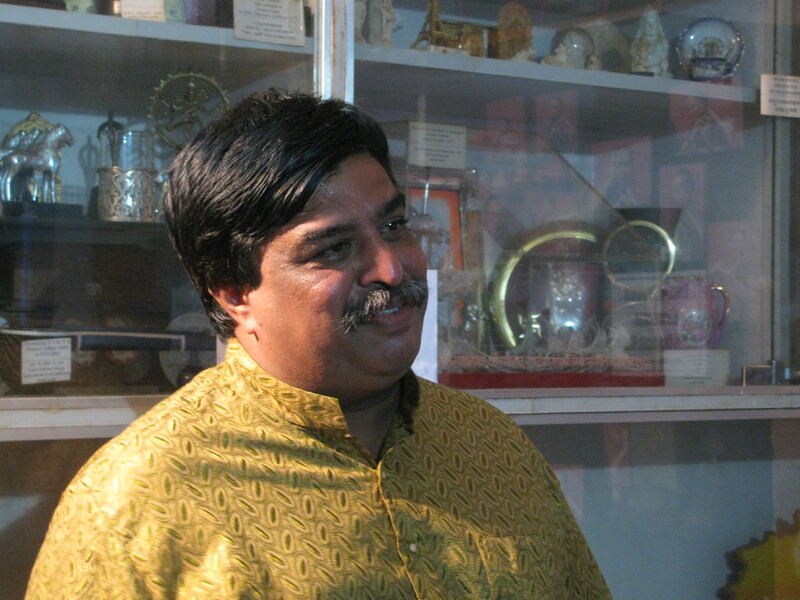 His compositions are sung by Hindustani classical vocalists. One version has it that Swami Haridas, teacher of Tansen, was a disciple of Purandara Dasa. Thus music was always around in these parts. Hubli-Dharwad’s ascent in Hindustani classical music happened with the decline of the Mughal Empire up north. As the empire weakened, the singing tradition of its court moved first to princely states in North India. Then as British influence gained in those princely states, the drift to the south started. Abdul Karim Khan was a famous singer of the Kirana Gharana, one of the schools of singing within Hindustani classical music. He was court singer in Baroda state. On his way to the court of the Mysore kings, who were patrons of classical music, he regularly halted in Hubli-Dharwad. In his book `Karnataka’s Hindustani Musicians,’ author Sadanand Kanavalli has particularly noted the role of the Mysore king, Krishnaraj Wodeyar IV. Mysore continues to this day as a major centre for Carnatic music. It was that less known intermediate halt en route, Hubli-Dharwad, which developed into the southern outpost of Hindustani classical music. 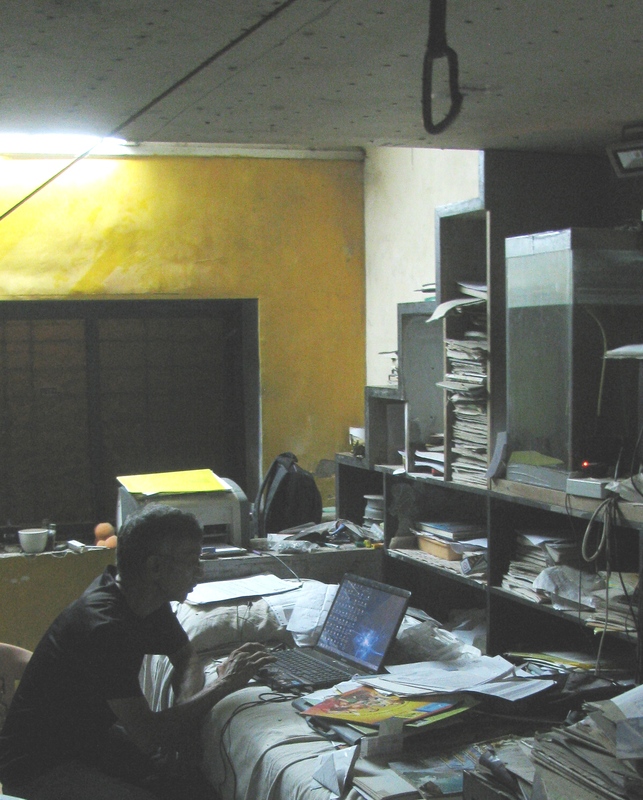 Through the years music researchers have wondered what worked to Hubli-Dharwad’s favour. In a November 2009 issue of `Sangeet Natak,’ a newsletter from the Sangeet Natak Akademi, Tejaswini Niranjana, outlining her proposed research into these questions noted that some of “ the common and (uncommonsensical) answers’’ included Abdul Karim Khan’s visits, the pleasant weather in Dharwad, the large number of Maharashtrians there who were music patrons, the influence of Marathi culture in the form of Marathi plays having Hindustani music with Kannada plays subsequently derived from them and even the chillies and spicy food of North Karnataka that cleared the throat. “ The answers are inadequate even on their own terms. If Abdul Karim Khan’s final destination was Mysore and he went there frequently, why did he not teach disciples there?’’ she asked. called the Nanasaheb Nadgir Smrithi Sangeeth Utsav. Hundreds of people turn up to hear this 24 hour-performance, which lasts through the night. The house is as it used to be, so much so that an entire audience crammed onto its many floors to hear the concert has triggered worries of the 400 year-old building collapsing. The architecture is typically old fashioned featuring a courtyard within. The musicians practise in an inner chamber and then perform on stage inside the house, adjacent to the courtyard and below a bust of Sawai Gandharva. It is tradition kept alive purely through family initiative and at considerable cost. The Nadgir family and a few close friends spent up to one and a half lakh rupees (that was the figure when I visited); they didn’t seek donations. Arjun was working on proper institutional shape for the funding so that it self-sustained. The family had dreams of starting a music school. Kundgol also had another music festival in Sawai Gandharva’s memory. Several noted Hindustani classical artistes – Bhimsen Joshi, Basavaraja Rajguru, Gangubai Hangal, Kumar Gandharva, Mallikarjun Mansur, Pandit Jasraj, Prabha Atre, Feroz Dastur, Puttaraj Gawai – they have all performed at Nadgir Wada. For many who go to sing there, the very act of performing in a house where legends lived is overwhelming. The artistes are paid for travel cost; they get nothing else. “ The ambience is special,’’ Jayateerth Mevundi, a prominent vocalist from the younger generation, said. Given Abdul Karim Khan as the historical prompter for Hindustani music’s arrival in Hubli-Dharwad, the region became the southern home of the Kirana Gharana, a style with origins in Uttar Pradesh. But you also find in Hubli-Dharwad other styles like the Jaipur Gharana and the Gwalior Gharana. They co-exist. From Abdul Karim Khan down, we hear of several important names. Broadly speaking, they can be divided into two categories – the legendary performers from Hubli-Dharwad and the great teachers like Sawai Gandharva. For a tradition of music to grow you need both these categories. As you ask around, you realize that great performers were not necessarily great teachers just as great teachers were not necessarily great performers. The great performers were five – Gangubai Hangal, Bhimsen Joshi, Mallikarjun Mansur, Kumar Gandharva (he was born near Belgaum and later moved to Madhya Pradesh) and Basavaraj Rajguru. Of them, one – Gangubai Hangal – was a phenomenon. Her influence exceeded the world of music. In Hubli, we just had to ask for the late singer’s house and the autorickshaw driver knew where to go. Her house had become part museum. 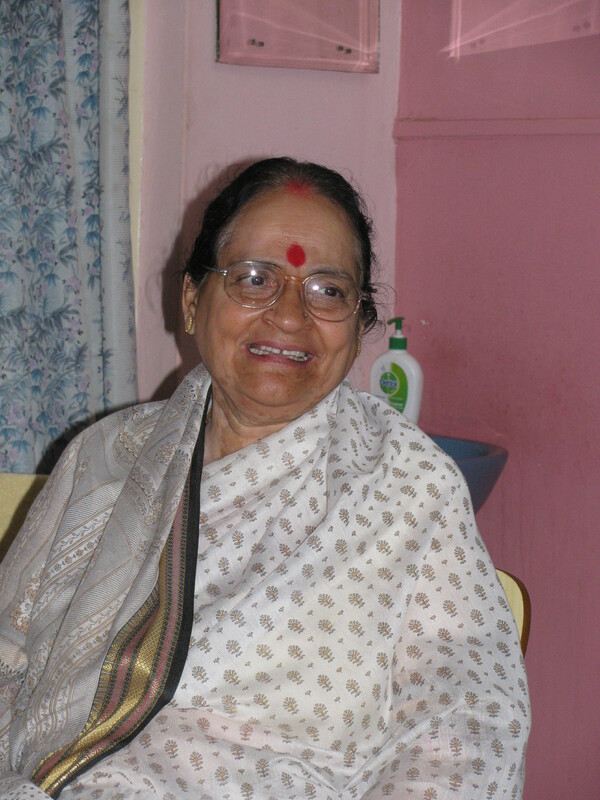 Gangubai Hangal had to overcome many social challenges to become the renowned singer she was. In later years, she did not hesitate to be a social activist for causes she believed in. It was exceptional in that, it took a classical vocalist out from the conventional image of exclusivity and singing for patrons, to being one with the masses. Consequently if anyone from the legendary five has become close to an institution in Hubli-Dharwad, it ought to be Gangubai Hangal. There was however one problem. With Bhimsen Joshi’s demise, the last of those five greats passed away. Further, except for Basavaraj Rajguru, none of the others were credited with robust teaching. They left behind few disciples. That’s why Hubli-Dharwad was suddenly important for anyone interested in Hindustani classical music, like me. The phase of the legends was over. Will the region continue to maintain its strong position in musical tradition? 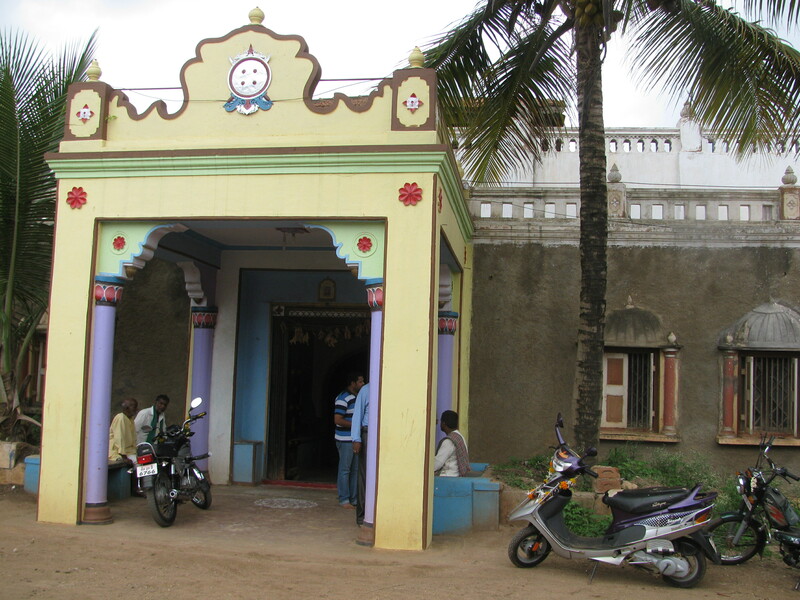 The Veereshwar Punyashram in Gadag appeared a blend of religion, community and music; an official brochure informed that the presiding pontiff was seen by devotees as “ a walking God on the Earth.’’ Looking past its prime when I was there in 2011, this institution was founded by Panchaxari Gawai, a blind prodigy in classical music. Over the years, the ashram accepted many poor, often visually and physically challenged children and trained them in classical music. Basavaraj Rajguru was Panchaxari Gawai’s student. Following Panchaxari Gawai’s death in 1944, Puttaraj Gawai took charge. He became blind through treatment for an eye problem in his childhood but later amazed as vocalist and musician. 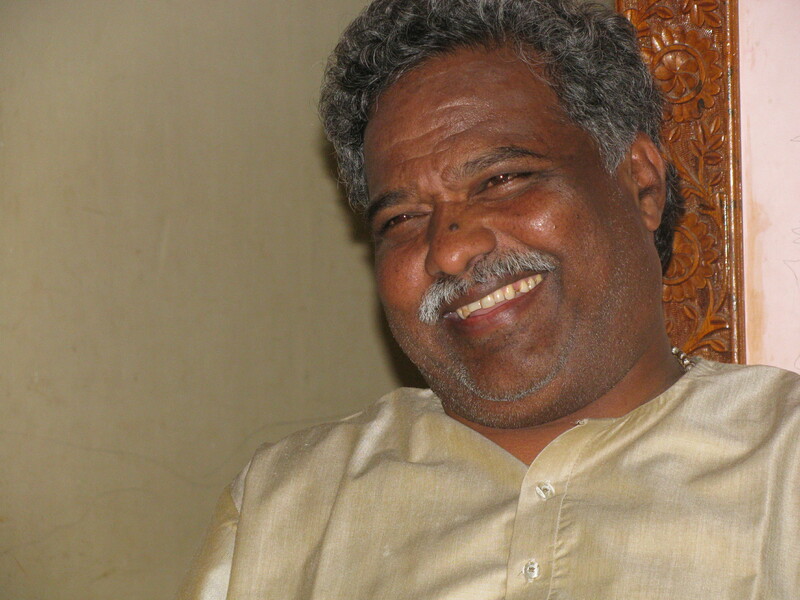 Venkateshkumar – he teaches at a music college in Dharwad and is acknowledged to be among the finest Hindustani vocalists today – was Putturaj Gawai’s student. Born in Lakshmipur village near Bellary, Venkateshkumar was thirteen years old when he was brought to the ashram in 1968. 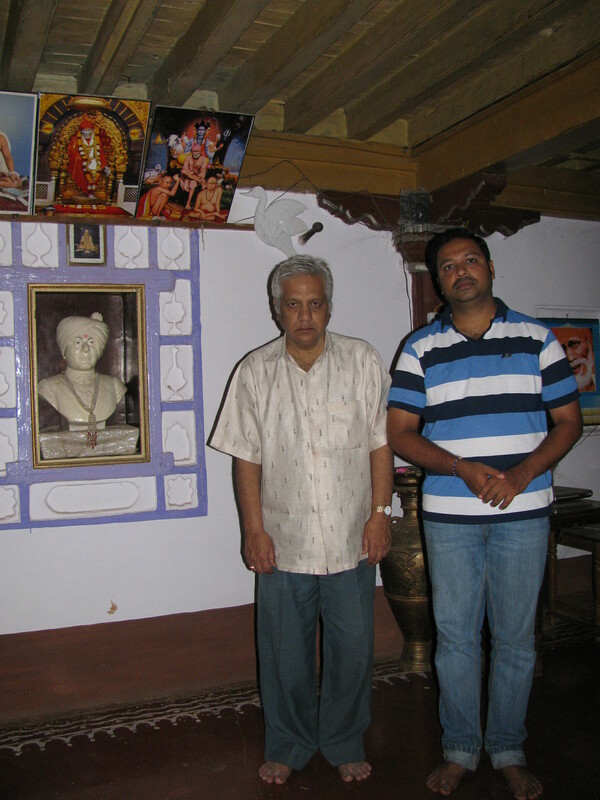 He studied there for eleven years, maintaining a rigorous training schedule and learning 25-30 raagas from his guru. Even after Venkateshkumar left the ashram his interaction with his guru continued till Puttaraj Gawai was ninety years old. Puttaraj Gawai died in 2010. In 2011, across the school and the college on its premises, there were nearly 800 students. volunteers from overseas), something useful to link training in classical art forms to the outside world. Its present location was second stop for the school. Previously it was at a leased farm in Kalkeri. The owner wanted to sell the property. Seeing its good work, the local village authorities granted it the current land. With time and growth, this had become inadequate and the school was looking for bigger, more permanent premises in the region. 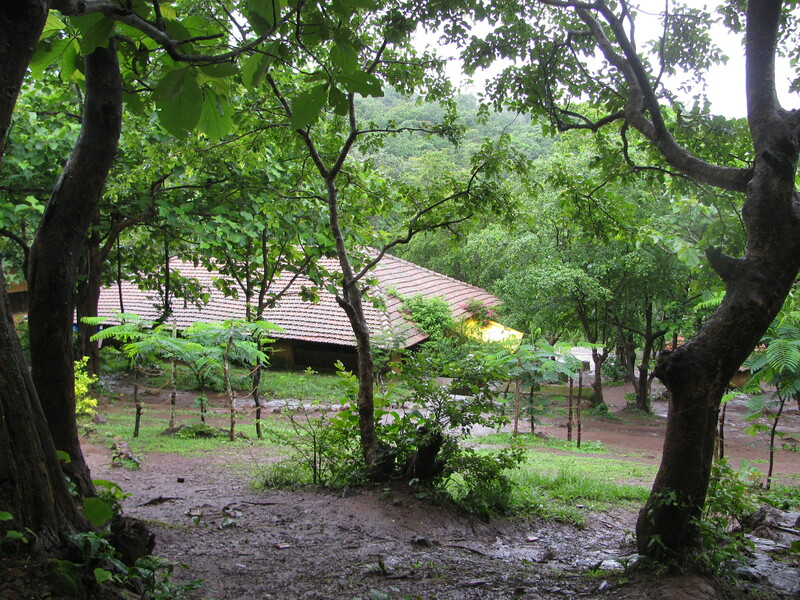 The Kalkeri Sangeet Vidyalaya is part of a unique organizational structure authored by its founders. Mathieu and his brother Blaise set up Young Musicians of the World (YMW) in Canada. Every year, as of 2011, it managed two fund raising concerts abroad to collect funds for the school in Kalkeri. This aside, the objective was to open similar schools elsewhere in the world; there were ongoing talks in France to start a music school for the Romany gypsies. Another location interesting YMW was, Mali in Africa. The eventual idea was to have music exchange programmes and concerts. To enable this, YMW required the Kalkeri school, indeed any school it started, to slowly become self reliant in funding. Moves were afoot to make this happen. The third institution we saw was expected to formally start work from July 1, 2011. Named after Gangubai Hangal it was a modern gurukul set up by the Karnataka government on the outskirts of Hubli. It could accommodate 36 students and their teachers. The gurukul pattern finds considerable respect among musicians in Hubli-Dharwad as one of the ingredients separating the performing artiste from the merely trained artiste. As many people pointed out, the music schools and colleges were important to create a learned audience for Hindustani classical. The performing artiste however needed a guru who knew him or her well; understood the student’s abilities, role modelled and confronted them with challenges. It was one-on-one education, an apprenticeship. According to Manoj Hangal, Gangubai Hangal’s grandson, the government announced five crore rupees (Rs 50 million) and five acres of land for the project in 2005. “ All approvals came within three days,’’ he said. Six gurus of different gharanas were each planned to teach six students for 3-4 years. 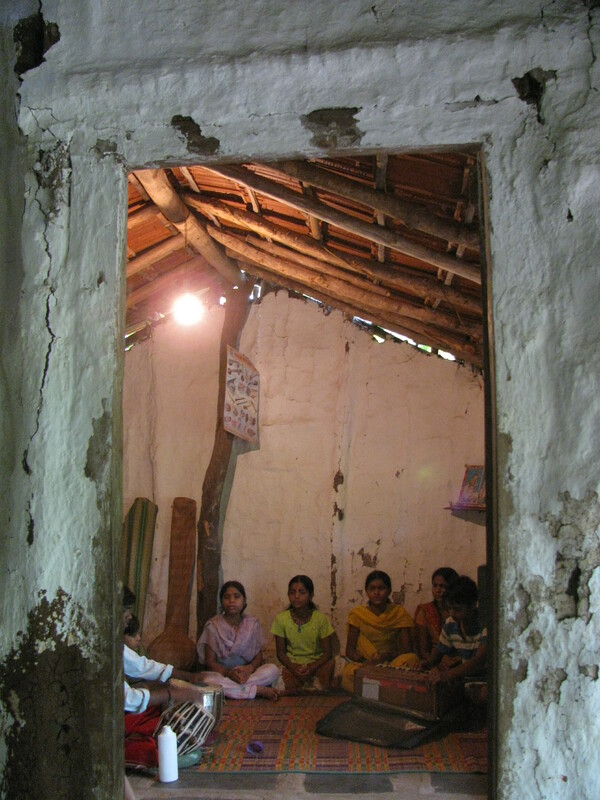 The teachers expected at the gurukul included Prabha Atre and N. Rajam. There would be visiting faculty from other universities. The emphasis was on creating performing artistes; that meant a student cannot enrol for any other academic programme. Total government expense for the impressive campus had touched eight crore rupees (Rs 80 million) and there would be recurrent expenditure of Rs 15 lakhs (Rs 1.5 million) to maintain it. 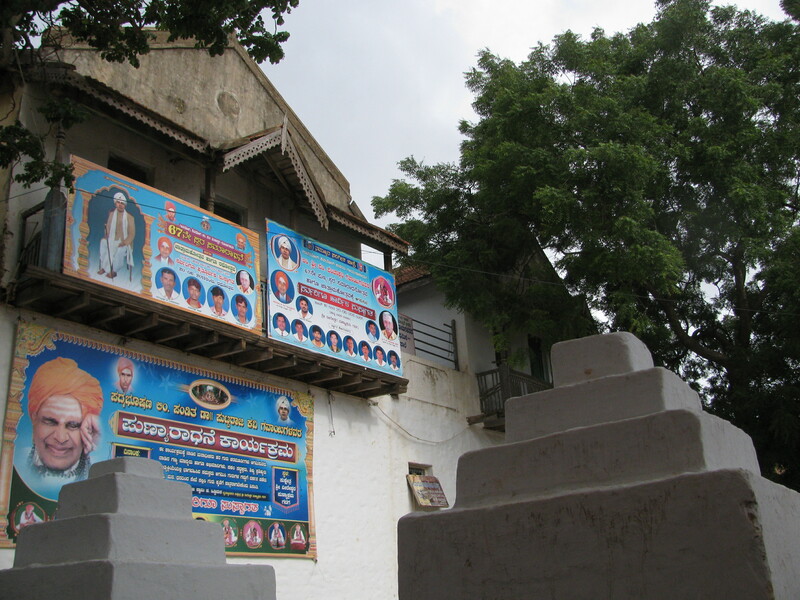 “ We want public access to the gurukul,’’ Manoj Hangal said pointing out how that only fit in with the reputation and legacy of Gangubai Hangal in Hubli-Dharwad. So would these training schools, music colleges and the large number of students, ensure that Hubli-Dharwad continued to generate fantastic performing artistes? Between talent and recognition lay the market. Hubli-Dharwad is an intriguing symbiosis of dedicated training away from market forces and giants born from that discipline who became icons in the far away markets of Mumbai, Kolkata and Delhi. With Bhimsen Joshi’s demise, the days of those legends had seemingly ended. There was a robust new generation in Hubli-Dharwad. 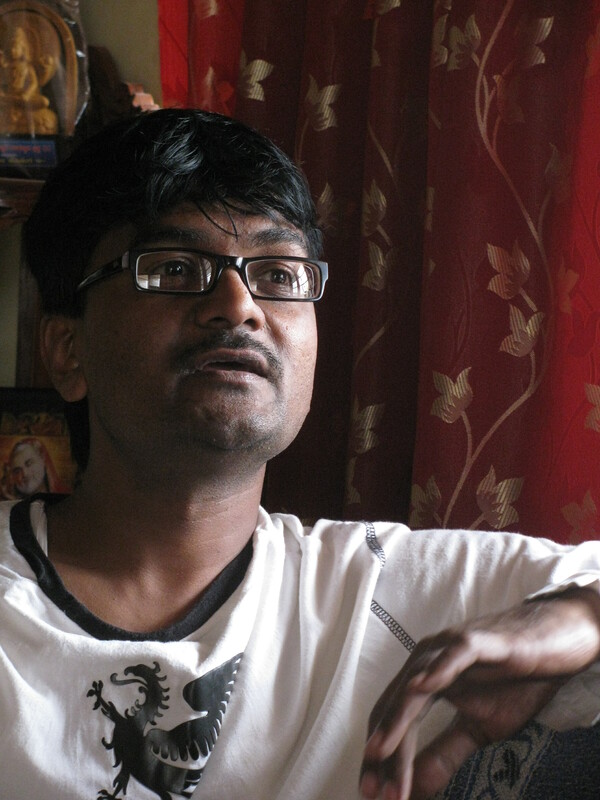 “ I am confident we will be able to fill the vacuum,’’ Kaivalya Kumar Gurav, an established vocalist and teacher, said. But for many others, with so much of change authored by not just music, the market loomed in the distance like an inorganic entity speaking a different language. If you looked back to the previous three generations or so of Hindustani classical performers, each generation had found the proverbial wind beneath the wings in factors ranging from royal patronage to the ascent of radio and recorded music. The first now belongs to a bygone era; the latter two are now past their prime. What survives is the impact of all this on the market – better awareness of classical music with the masses and support of music by the `classes.’ Opportunities are available. Question is – who gets them in these years of survival through smartness? Does smartness constitute music and how smart should Hubli-Dharwad be when its beauty, perhaps uniqueness, is that it has been distant from the market? One problem you hear is how major public performances have got dominated by the same, few names. Sponsors rule the big concerts in the metros (although Hubli-Dharwad has a tradition of concerts organized by aficionados willing to contribute for the purpose, sponsorship has arrived here too). Big ticket sponsors, seek the maximum bang for their buck and it often means, correspondingly less concern for upcoming talent within the music world. Result – they plonk for the established names, setting in motion a vicious cycle of promoting the same names, even their children. Travelling through Hubli-Dharwad, this new age networking and success by successful networking saddened me because North Karnataka not only produced great musicians in the past but some of them – like Gangubai Hangal – questioned tradition and confronted the social networks and privileges of their era. The citation for the 1989 Ustad Hafiz Ali Khan Award, given to Gangubai Hangal, began with this sentence, “ you are among the legendary group of women who braved social scorn and ridicule in establishing classical music as a noble profession for women in modern India.’’ Now as we celebrate the age of the social network and as the social network becomes the new tradition, talent has become secondary again. We haven’t changed; we seem to simply reinvent the old. At Gadag, we ran into young Ayyappaiah Halagalimath who learnt classical music at the Veereshwar Punyashram and went on to complete his MA in Music with top honours. A student of Venkateshkumar, he was guest lecturer at the same college where the maestro worked. Like many who studied at the ashram, Ayyappiah hailed from a poor family. He has performed in big cities. But lacking good Hindi and English, he was hemmed in by his inability to tap the social network. That worry was writ large on his face. Between talent and recognition, there is the market; there is that network. It plagues every field and as the network grows in importance, I wonder – are the best in every field necessarily what the commercial network showcases as the best, the most successful? A common way of introducing upcoming music talent to the market is by clubbing their performance with that of a big brand musician. So you have that half hour or one hour at start by a mid-level artiste and then a performance by the big brand who the sponsor thinks is the real talent. According to musicians, although intended to help, this practice simply institutionalises upcoming talent as secondary to established names. Because it is presented as upcoming talent requiring a walking stick (the established big musician), it reinforces the paradigm of sponsor deciding talent as opposed to the audience doing the same. Differently put, in the name of the market we may be belittling the intelligence of the audience in the age of janaashraya. Why not let the audience choose? But then how perfect are choices by audience? At stake amidst sponsors and the market compulsions of media formats (like reality TV shows) claiming to represent popular tastes, are entire crafts. “ One of my students topped a reality show. Now all his singing is for the channel. Reality programmes make you a success prematurely,’’ a senior artiste and teacher, said. Arguably, all media – including this blog – is imperfect, to the extent that an article or a photograph or a TV programme is usually a slice of something, never the evolving whole or the whole in the context of everything else. And if, for alternative, you choose to merely stream real life as media, you miss intellect – which is a serious drawback in today’s media filled-world. Reduced by media to voyeurism, abject competition and consumerism, we succeed more and more with lesser and lesser dimensions in the head. We become dumb? I suspect so. A point that frequently surfaced in discussions on what shaped the performing artiste was how the legends became what they were despite few raagas taught by their gurus. The rest was dedicated, hard work. Over eight years, Abdul Karim Khan taught Sawai Gandharva just three raagas. His rationale was – if the student understood those three well, he would pick up the rest. Sawai Gandharva taught Bhimsen Joshi three raagas. Nothing happens without personal drive. “ There can be many students but there is only one disciple,’’ Professor Vasant Karnad, well known musician, music critic and teacher, and elder brother of Jnanpith Award winner-Girish Karnad, said. Legends are not born from a market state of anything. How long will it be before the next Gangubai Hangal or Bhimsen Joshi? Between the two, the next Gangubai Hangal would be a litmus test for Hubli-Dharwad. It was a question nobody could offer convincing explanation for – why haven’t there been great women singers from Hubli-Dharwad other than the legendary Gangubai Hangal? Some cited marriage, family responsibilities et al. At least one school official that we spoke to confirmed that convincing families in villages of the practical use of an education in music was difficult and within that, getting the girl child enrolled was more so. It seemed the other side of conservative society, which by virtue of its conservatism steels an individual’s resolve to pursue his or her talent but also leaves many in the dust. Finally, there was the concern over where the general drift in the world was headed and what that meant for Hubli-Dharwad. “ With the growth of industry, the cultural milieu will fade. Formerly we used to say that food and knowledge should never be bargained or sold. Today, they have become the most important items of business,’’ Ramakant Joshi said. I got back to Mumbai. Freelance journalist’s article was published. In August 2011, Professor Vasant Karnad passed away. He had been a delight to talk to during the brief while we met him. We remain grateful for that conversation, the opportunity to meet him. End-October 2013; backstage in Mumbai, Pandit Venkateshkumar recognized us from the old visit (in 2011, we had gone to his house in Dharwad). We exchanged greetings. Established singers, aspiring ones and students of music had already flocked to him after the concert. I am none of that. I identify with his music thanks to what is at once a restlessness and peace, found in the outdoors. It inhabits many fields and I suspect that the word in English which comes closest to describing the condition is – seeking. A mind cast so finds peace in sense of universe. Music, the outdoors – it is all One.